The summer of 2003 proved to be the hottest summer for thirteen years! While war in Iraq and the retirement of Concorde grabbed the headlines, current Archaeology Live! supervisors Arran and Gary were still undergraduate students at the University of York. Project Director Toby, however, was already in the thick of it – graduating to the role of Assistant Site Manager in 2003. 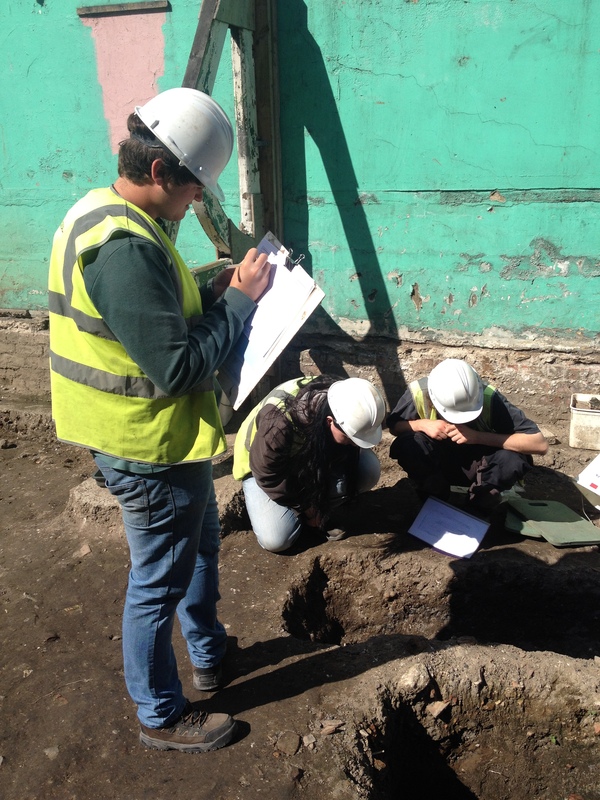 As the dig progressed the team kept a detailed site diary, so we’ll let them tell the story in their own words. The Lord Mayor breaks ground. “To summarise the discoveries to date: the investigation of the south-west defences of the Roman legionary fortress has been concentrated on part of the stone inverval tower SW6 in Trench 1, which is thought to have been built about AD200 and was only demolished during redevelopment of the medieval hospital of St Leonard around 1250. A hospital stood on the site by 1100, when a two-storey stone building (almost certainly the infirmary) with a vaulted undercroft was built between the Roman tower SW6 and the west corner tower of the Roman fortress (known as the Multangular Tower). Extensive evidence for occupation within the undercroft, probably including cooking and metal-working, was recovered. The hospital was largely demolished after the Dissolution of the Monasteries by Henry VIII, and the site used for industrial purposes. During the 19th century the site was cleared and landscaped, and it remains a lawn to this day, albeit it briefly augmented by an air-raid shelter during World War 2. The strategy for 2003 is to complete the excavation of that part of Trench 1 under the standing remains of the medieval hospital undercroft (the part outside the standing building was excavated to the bottom last year), and to continue the excavation of Trench 3. In addition up to three additional trenches may be excavated, in order to answer questions raised by the work carried out to date. For those thinking about taking part in the dig in the future, be warned that 2004 is expected to be the final year, with the completion of the excavation of Trench 3 and any additional trenches that have been opened. 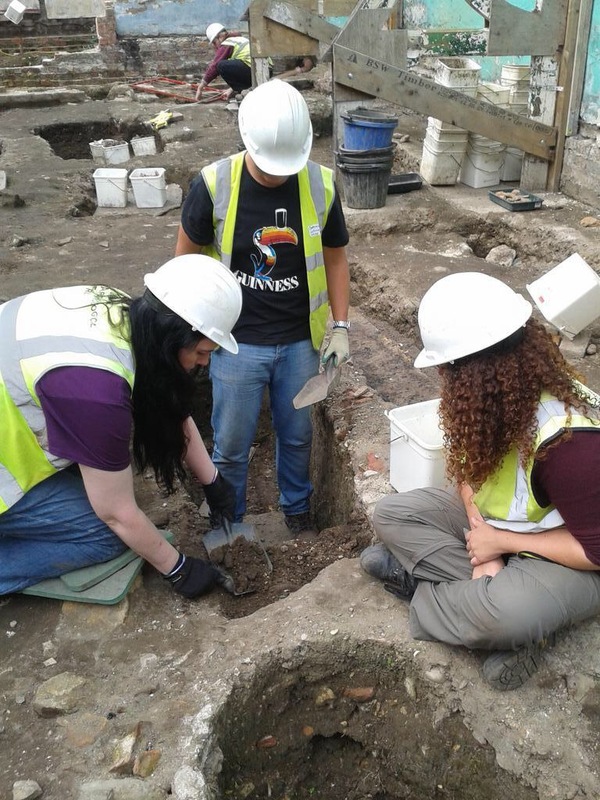 Although the previous season of excavation at St Leonard’s Hospital seems like yesterday, it was indeed time for the third summer season of the dig to begin at the start of July. There was a hectic week of site preparation, with the visitor access laid out and the large volume of backfill from Trench 3 removed by machine. On 8th July the site was opened to visitors, following the official opening by the Lord Mayor of York, Chas Hall, and the Lady Mayoress. 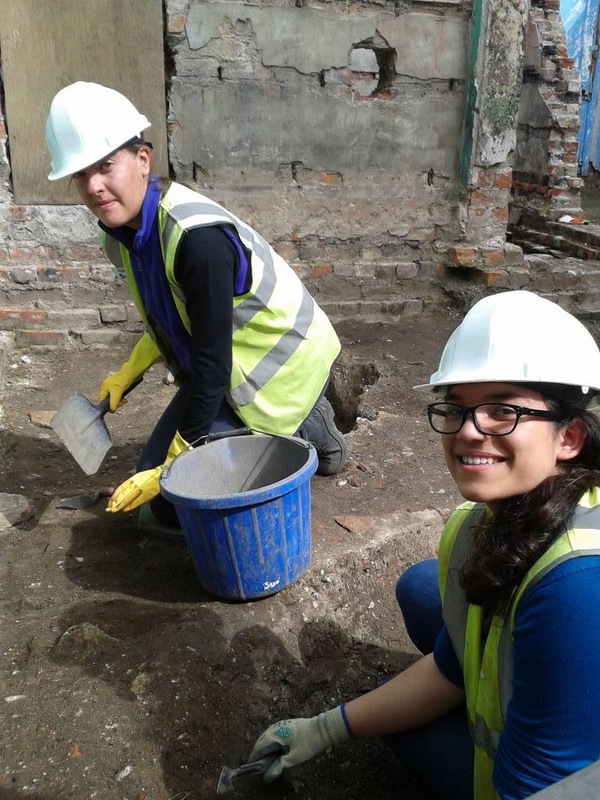 On the same day the first group of trainees began their training on the excavation, and after their introduction to the site they were soon getting their hands dirty with digging, site recording and finds work. In Trench 1, the excavation of the dumps underlying the standing remains of the medieval infirmary, which had begun in 2002, continued. These deposits were formed by the large-scale tipping of soil and other waste prior to the construction of the large Anglo-Norman timber buildings found last year, which may have been part of the original medieval hospital. Although the Roman interval tower excavated at the north-west end of Trench 1 has yet to be reached at the southern end, the large quantities of Roman pottery found already suggest the tower is not much lower down. 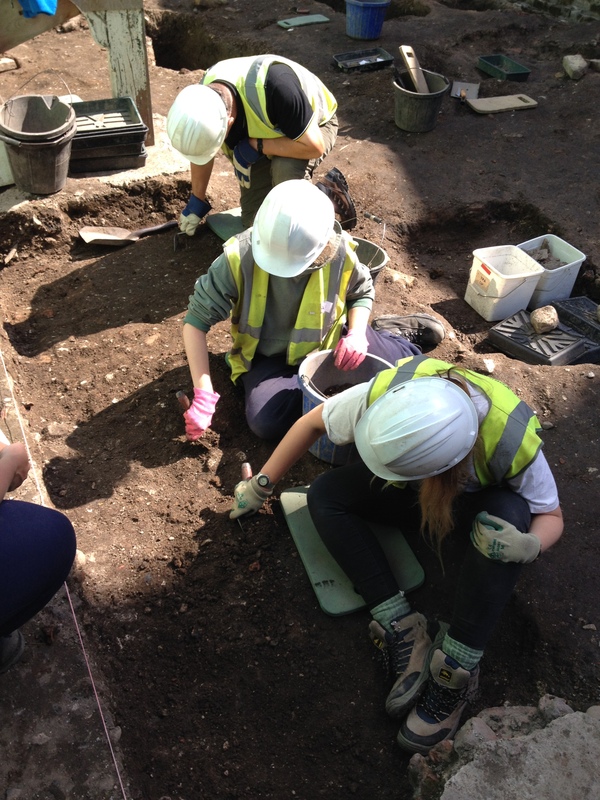 In Trench 3, work concentrated on the investigation of the initial construction of the original infirmary undercroft, which is thought to date to about AD1100 (give or take a few decades). After no little effort the column base that has been for so long a feature in the centre of the trench was removed, and was found to have rested on a platform of mortared limestone fragments. 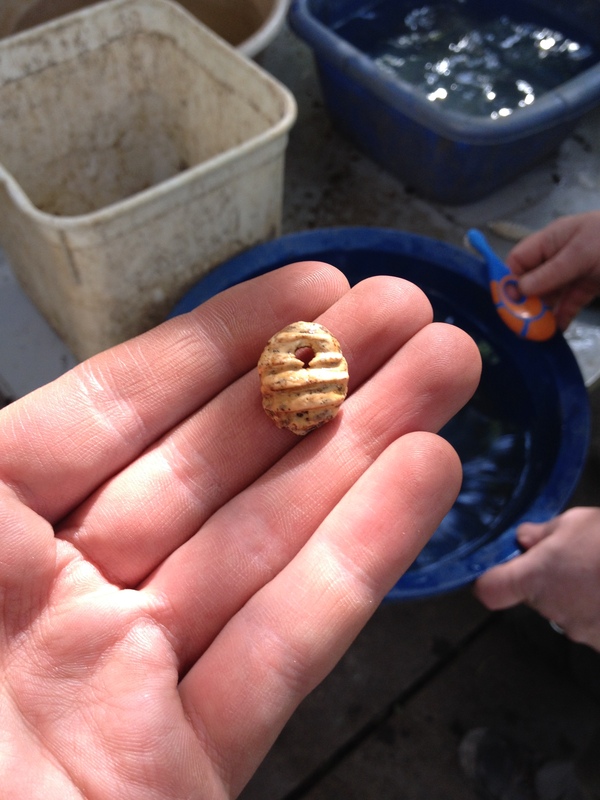 Two of the more interesting finds made this week were part of a decorated bone object; and an oyster shell that had been perforated, perhaps for use as a pendant. 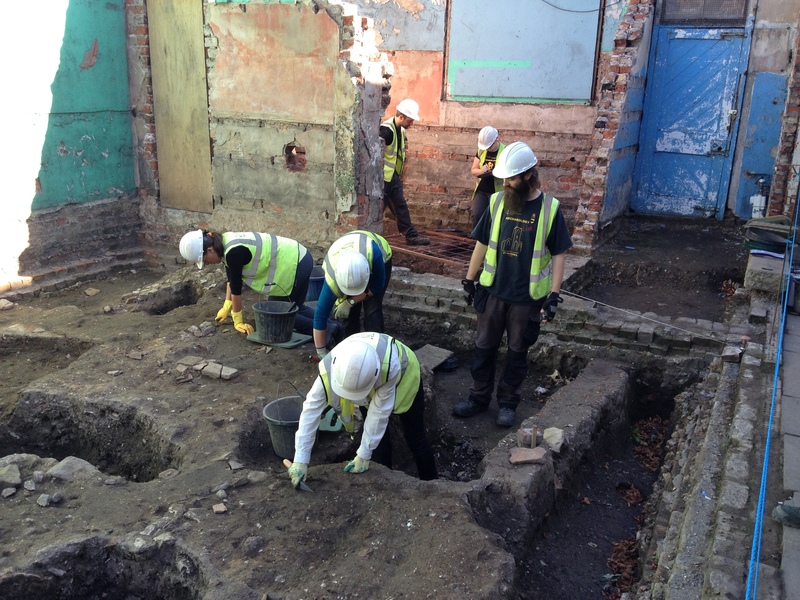 Despite very changeable weather the excavation progressed well, with another full complement of excavation trainees. In Trench 1 the excavation of dump deposits, probably of 11th/12th century date, continued. There was no sign of the south-east wall of the Roman fortress interval tower SW6, but we are confident it is down there somewhere! In Trench 3 the foundation platform for the column base in the centre of the trench was removed, revealing an area of cobbles. It is assumed these cobbles are in a foundation pit that provided further support for the column, but only time will tell. A view of Trench 3. Can you spot the cobble foundation in the centre of the trench? With the return of Assistant Site Manager Toby Kendall from secondment in France, it was possible to open up the first of the new trenches. Trench 5 lies to the north-west of Trench 3, and is intended (among other aims) to locate the north-west end of the infirmary block and to investigate the relationship of this structure to the Roman Multangular Tower at the west corner of the fortress. The garden topsoil and other modern deposits were removed. A new course for 2003, surveying, was run during this week. Toby Kendall demonstrated the basic surveying techniques, including laying out a site grid and drawing building elevations, and the use of an Electronic Distance Measurer (EDM) to record features on a site. Geophysical survey was taught by Dr Mark Noel (GeoQuest Associates), Professor of Geophysics at the University of Durham. 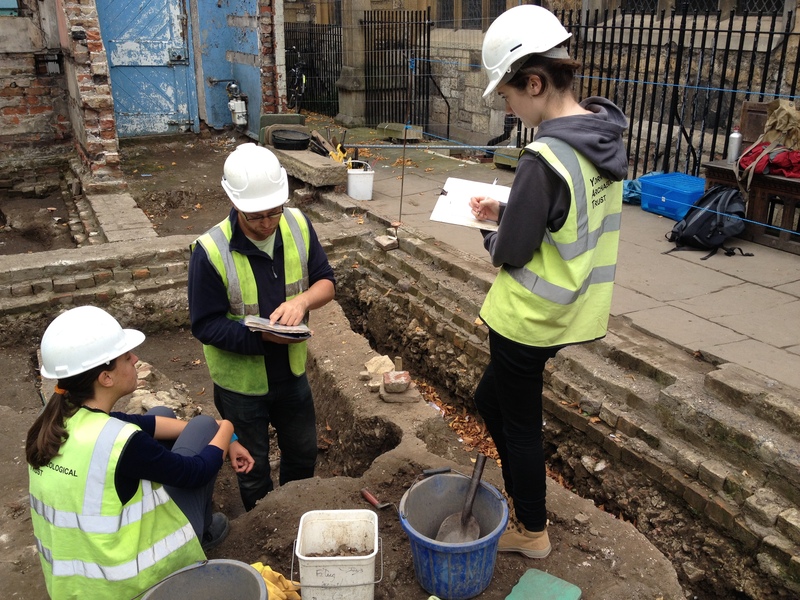 Apart from allowing the trainees to develop the surveying skills and techniques, the course made possible further recording of the medieval hospital and adjacent structures. The geophysical survey was carried out at Acomb Grange, a monastic farm close to York that was run to provide food and other materials for the hospital. A good time was had by all. Over the weekend, special events were laid on as part of the National Archaeology Days organised by the Council for British Archaeology. The re-enactment group Comitatus provided demonstrations of living history at the end of the Roman period on one day, and on the second day laid out a ‘history street’ forming a physical timeline of the history of the site from early Roman times to the medieval period. Sandra Garside-Neville presented a display on brick and tile. Russell Marwood demonstrated war-gaming with a re-construction of the battle of Powicke Bridge, the first engagement of the English Civil War. A notable find from Trench 5 was a Roman voussoir brick with a wedge-shaped profile, which would have been used in the construction of archways or vaulting. It is possible such vaulting was employed in the construction of the Roman fortress towers. Another very busy week on the excavation, with a full complement of excavation trainees and another group undertaking the first artefact study course of the year. So far an average of 1,300 people per week have visited the excavation, which is very encouraging. The artefact course examined the whole range of finds and environmental material from several contexts dating to the early years of the medieval hospital. This showed that a great deal of waste material had been dumped on the site during the construction of the hospital. One layer produced amphibian bones and snail shells from the environmental samples, suggesting it may have been collected from alongside the nearby River Ouse. Although much of the pottery from these contexts was Roman, the small amount of 9th-12th century pottery showed that the Roman pot was residual (that is, it had been around for a long time when it was dumped) and the contexts actually dated to the time of the medieval hospital. On the excavation, in Trench 1 further medieval dumps were excavated, but there was still no sign of the south-east wall of the Roman interval tower SW6. Perhaps this part of the tower had been more thoroughly dismantled than the north-west wall observed in 2002. In Trench 3 the limestone platform supporting the undercroft column was removed, revealing a large cobble and clay-filled pit. This feature is comparable in appearance to that already partly excavated towards the south-west end of the trench, and is likely to be quite deep (so as to minimise settlement of the building). Meanwhile excavation of the levelling deposits at the north-east end of the trench continued, producing a wide range of mainly Roman finds. Medieval levelling deposits under excavation in Trench 3, with the foundation pit in the background. A fragment of Roman Samian pottery with the maker’s stamp VIDU[CIUS?]. This high-quality red-slip ware was made in Gaul (modern France). In Trench 5 a large rubble-filled cut was found in the south-west part of the trench. This is almost certainly the demolition cut for the World War Two air-raid shelter. An impressive range of finds of Roman to modern date was recovered from the fill. A general view of the site looking north-west towards the Multangular Tower, showing Trench 3 in the foreground and Trench 5 to the rear. This was yet another busy training week with all 16 trainee places snapped up. Most of the people were from the UK, but the USA was represented. Over 2000 people visited the site this week, a brilliant achievement, bringing the total this season to over 6000. Most visitors have gone away from the excavations saying how fascinating and interesting the work that we are undertaking is. 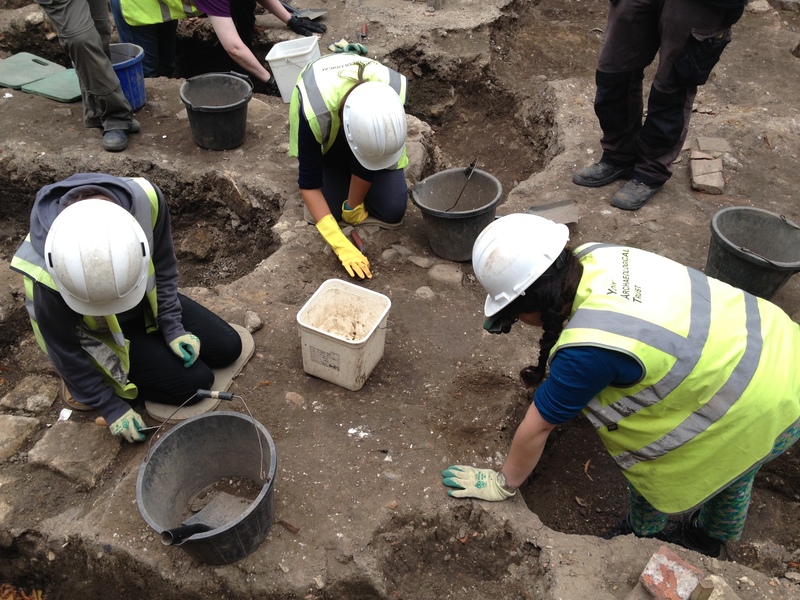 Yet more medieval deposits were excavated, but on the final day of the week a short length of masonry wall was uncovered. Could this be the south-east wall of the Roman interval tower at long last? This trench was now approaching its safe depth limit of 1m, and the sides were shored up in order to ensure the sides of the trench (and the standing medieval undercroft) do not collapse. A major advance in the excavation of this trench occurred this week, with the erection of a shelter on a specially designed metal frame. This shelter should ensure that the trench is protected from the weather, be it soaking rain or baking sun. More 11th/12th-century levelling deposits were removed to the north-east of the column base position. These layers had a distinctly green hue, and were thought to be mostly dumps of waste material. They were divided into two working areas; one side was removed rapidly using mattocks to look at the overall nature of the dumps, whereas the other side was more carefully dug layer by layer. Excavation of the clay and cobble fill of the column base foundation began in earnest. A surprisingly large number of mostly Roman finds were recovered, including many fragments of painted wall plaster. Was the construction of the medieval infirmary associated with the demolition of major Roman buildings in the vicinity? The large cut found last week now occupies the entire south-west half of the trench. The rubble fill includes much reinforced concrete, and is clearly derived from the demolition of the World War Two air-raid shelter. In the north corner of Trench 5 a narrow cut with vertical sides, aligned west to east diagonally across the trench, came to our attention. Excavating the air-raid shelter demolition cut in Trench 5. The orange sand visible in the section forms the upper fill of the cut; a similar deposit was found in the uppermost fill of the same cut in Trench 3 in 2001. It is thought to be a 20th-century archaeological trench, probably following the south wall of the Roman Multangular Tower where it projected back inside the fortress. Yet more great finds dating from the Roman period through to modern times were recovered from the backfills of these features. It’s been a brilliant week, with almost as many visitors to the site as the previous record week. Trainees from Italy, the USA and England were treated to the usual rigorous tuition. It was great to see some familiar faces from last year returning; some may suggest they were gluttons for punishment! Read on for the exciting new developments within the trenches. Hurrah! Further investigation of the masonry uncovered last week showed that it was indeed the south-east wall of the Roman interval tower SW6. However, it had been almost entirely demolished, and even the facing stones on the inside of the wall had been removed. Evidently the series of medieval deposits excavated in recent weeks were the backfills of a large robber trench that had been dug down to and around the tower wall in order to remove the usable stone. Investigating the wall of interval tower SW6 and the medieval robber cut in Trench 1. These deposits contained much domestic rubbish, including pottery, brick and tile. These finds suggest an 11th/12th-century date for the robbing, although most of the finds were residual (much earlier than the date of their deposition) and included a prehistoric struck flint. Work continued on the complex sequence of green dumps at the north-east end of the trench. 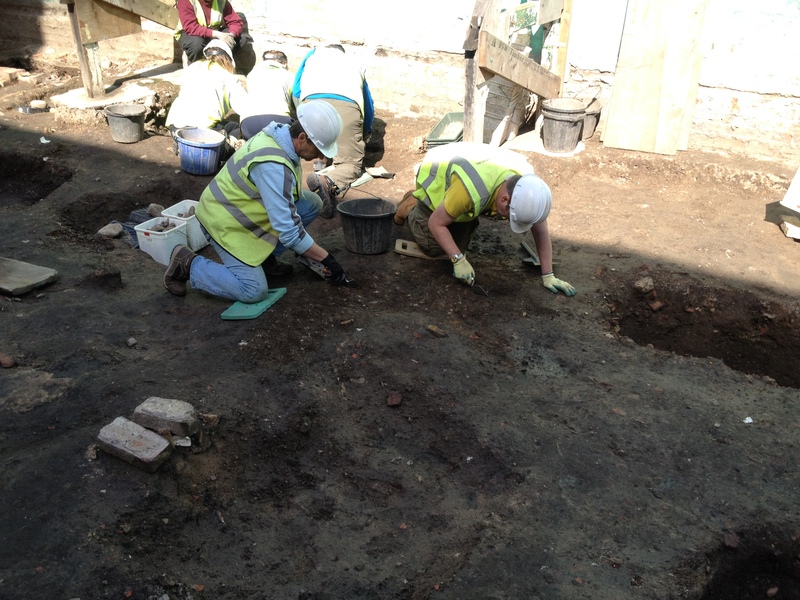 Excavation also continued within the medieval foundation pit in the centre of the trench. Excavating the Anglo-Norman levelling deposits in Trench 3. The undercroft foundation pit is visible to the left. Several stake-holes and an unsual slot were also revealed this week. The slot was associated with a large post-hole or small pit, both being backfilled with deposits which were an olive greenish brown colour. It is difficult, at present, to imagine the functions or uses of these two features, but they appear to have been in use during the construction of the Anglo-Norman infirmary undercroft. General view of Trench 3 looking south-west. The medieval foundation pit under excavation is in the centre of the trench, and beyond it the cobble fill of an adjacent foundation pit is visible. Artefacts recovered this week included fragments of glass, metal-working slag, a stone bead and a copper object, possibly a bezel with an amber insert. English Heritage agreed that, as we were making good progress with the excavations, another of our proposed new trenches could be opened up. Trench 4 will expose two features previously uncovered during the recent excavation programme – part of the medieval stone drain, which was found in our Trench 2 in 2001; and the entrance to the World War Two air-raid shelter, revealed by Time Team in 1999 (link prologue). 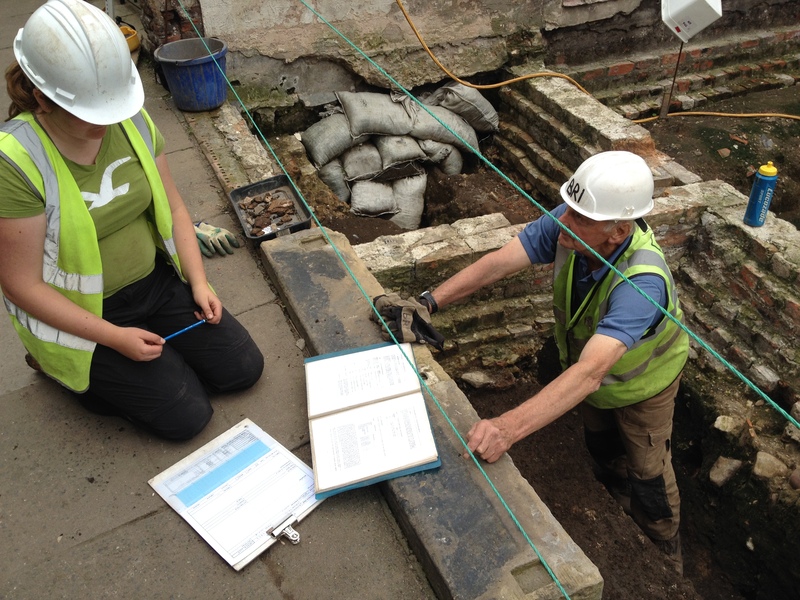 This trench is also designed to assess whether the deposits associated with the Roman fortress and the medieval hospital survived the 19th-century excavations and the air-raid shelter construction. Work began on the removal of the modern overburden of topsoil and gravel. This week there was a determined effort to try to remove the thick rubble layers infilling the demolished air-raid shelter. In doing so we reached the safe excavation depth limit of 1.5m in this trench. In addition to the usual fine array of Roman and later finds recovered from these layers, an unusual metal vent was found. This vent was probably situated on top of the air-raid shelter to let air into it from the surface. In the north corner of the trench we have continued to explore a 20th-century archaeological trench. Although it is thought this trench follows the line of the south wall of the Roman Multangular Tower, the wall has not yet been located despite the removal of considerable depth of backfill deposits. The impressive range of finds unearthed in these fills, dating from the Roman period onwards, is intriguing, as it suggests that the excavators at that time didn’t keep as many of their finds as we do nowadays! What a week for visitors! 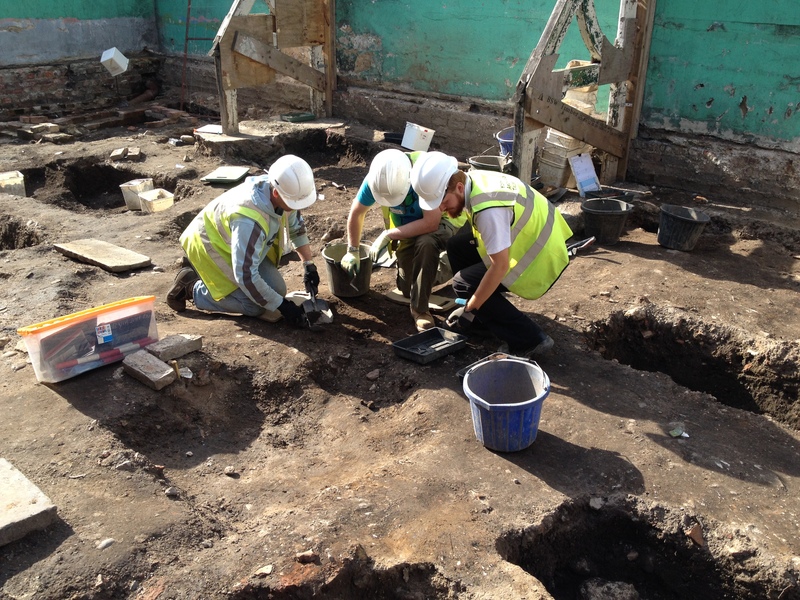 This has been an exciting time on the training excavation, the busiest ever for visitors. We smashed all existing records for visitor numbers to the St. Leonard’s Hospital excavations, pulling in 2,123 visitors this week. Over 10,000 people have now visited the excavations since the start of July and seen the exciting world of deep urban archaeological excavations. Visitors watch the finds work takingplace on site. To add to the visitor experience, staff and trainees have been showing the public the processes behind finds work – cleaning, cataloguing and recording the finds as well as the detailed finer points of environmental processing – searching for tiny animals bones, charred seeds, nuts and grains and other important ecofacts. More of the Roman interval tower wall was exposed, showing that the wall had been even more thoroughly robbed than originally thought, down to foundation level. Many mortar fragents were found at this level, no doubt resulting from the demolition of the wall. The south-east wall of interval tower SW6 in Trench 1, with the medieval robber cut and its fills visible in the foreground. Artefacts recovered from the medieval robber trench backfill deposits included fragments of early Roman Gallo-Belgic ware, particularly that known as Terra Nigra, as well as some Roman glass. The excavation of the medieval foundation pit had now reached a depth of about 1.5m with no signs of the base of the cut appearing. Clearly the medieval builders had constructed suitable foundations for the massive infirmary building. The green dumped deposits being excavated on the north-east side of the trench were found to contain much domestic waste as well as charcoal, burnt clay and metal-working debris. A view of Trench 3 looking north-east, down the slope of the fortress rampart. These deposits were mixed with material thought to have been taken from the Roman fortress rampart. This probably shows how the even surface for the construction of the medieval infirmary was formed, by removing the top of the rampart and dumping it on the lower slope of the rampart along with any other marterial that was at hand. Excavating in Trench 3, with a stepladder being used in the medieval foundation pit for access! The large quantities of Roman finds in these deposits is therefore not so surprising. Roman artefacts recovered this week including fragments of window and vessel glass, several coins and more painted plaster. After the removal of the modern overburden, the positions of Time Team’s trench excavated in 1999, and the edges of Trench 2 which we excavated in 2001, were identified. This exercise also revealed that some archaeology survives between these two trenches as well as in the area to the north-west of the Time Team investigation, which bodes well for the future. During this week we have been concentrating on unravelling the relationship between the deposits infilling the World War Two air-raid shelter and a 20th century excavation trench. Excavating the 1950s trench in Trench 5, with the World War Two air-raid shelter cut behind. Careful excavation revealed that the excavation trench was in fact later than the air-raid shelter demolition deposits and therefore probably dates these excavations to the 1950s. During this painstaking excavation a further possible excavation slot that pre-dated the air-raid shelter was also revealed. This may equate with Miller’s investigation of the Multangular Tower in the 1920s. The sections revealed by the re-excavation of the 1950’s trench suggest that a complex sequence of archaeological deposits survives in this area – a tantalising glimpse into what will be dug over the following weeks. 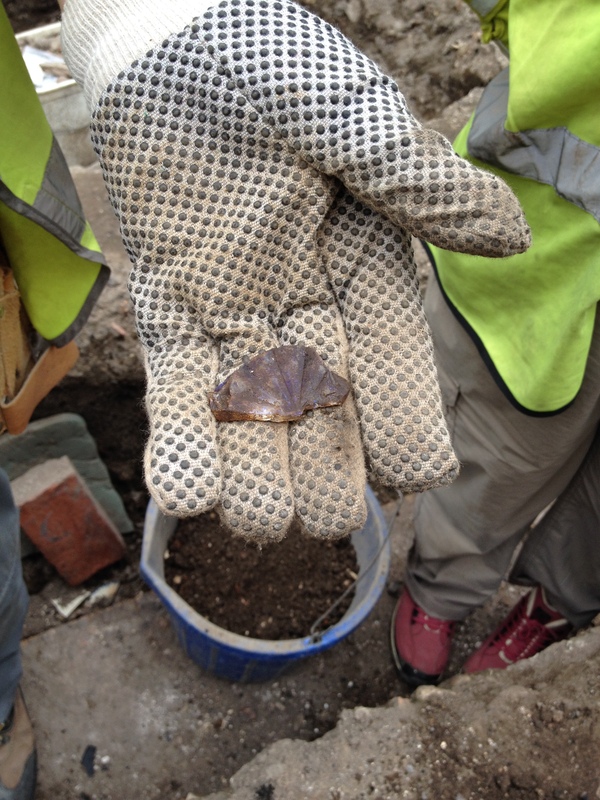 Artefacts recovered this week included medieval glazed floor tiles and the jug handle from a medieval flagon. Trainees and staff relax at the end of another successful week! Smashing the record for weekly visitor numbers is becoming a recurring habit here at St. Leonard’s; an incredible 2200 vistors touring the excavations this week. Total visitor numbers for this season have now passed the 12,600 mark. Work continued with training and excavating within all of the trenches, with most trainees coming from the UK, but with one from Switzerland. Read on for exciting new developments and dilemmas. 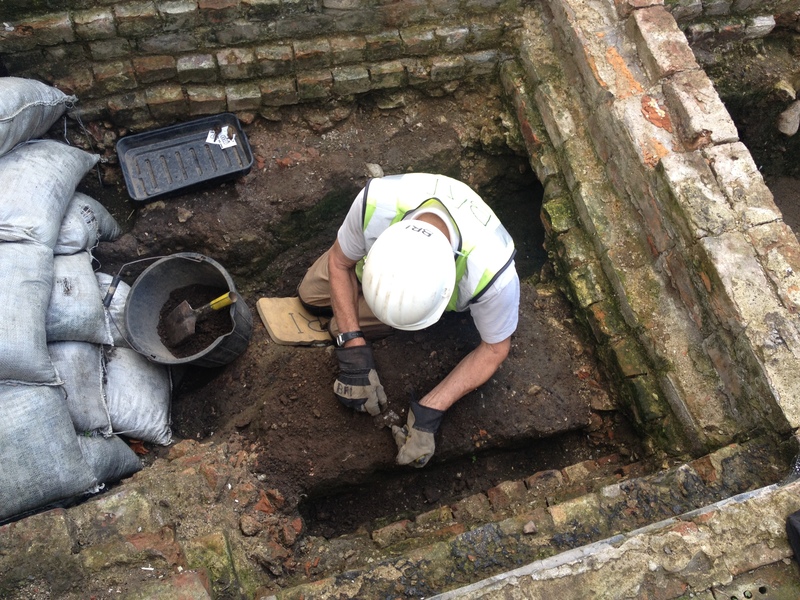 Excavation continued within the Roman interval tower SW6. Although this trench had largely reached its safe depth limit, permission was given by English Heritage to excavate a small slot in the middle of the trench through the deposits within the tower, to search for deposits and features associated with its occupation. 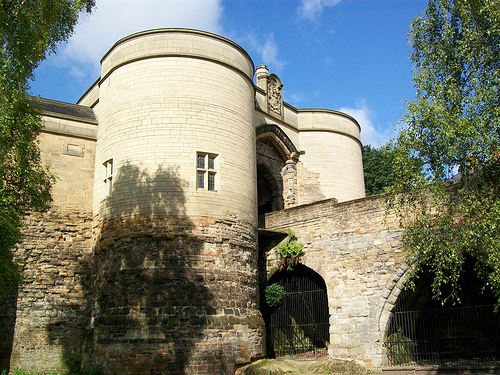 This has revealed that the main south-east wall in this part of the interval tower had been robbed of facing stones, and the concrete beam on which it was constructed chipped away; this robbing had also removed any occupation deposits within the tower. The deposits that backfilled this robbing activity were very different from the dumps excavated in Week 6. They consisted of sand and burnt clay and tile suggesting that the material derived, at least in part, from the demolition and clearance of a hearth structure or furnace close by. 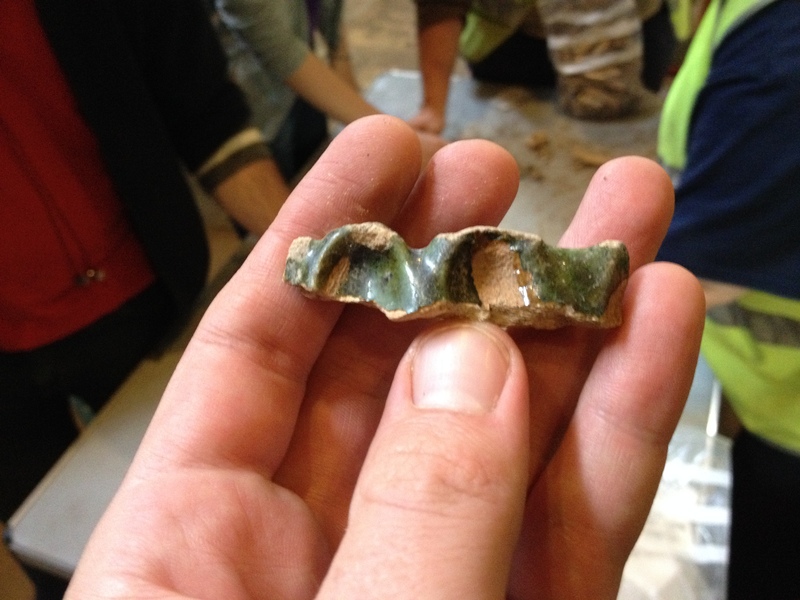 Only Roman pottery including Samian and rusticated wares were recovered this week. Could this suggest that the wall was robbed in the Roman period? Having removed all of the green dumps on the eastern side of the trench, we began tackling a series of homogenous dumps this week These appear to mimic the slope of the Roman rampart that we imagine survives at a lower level. 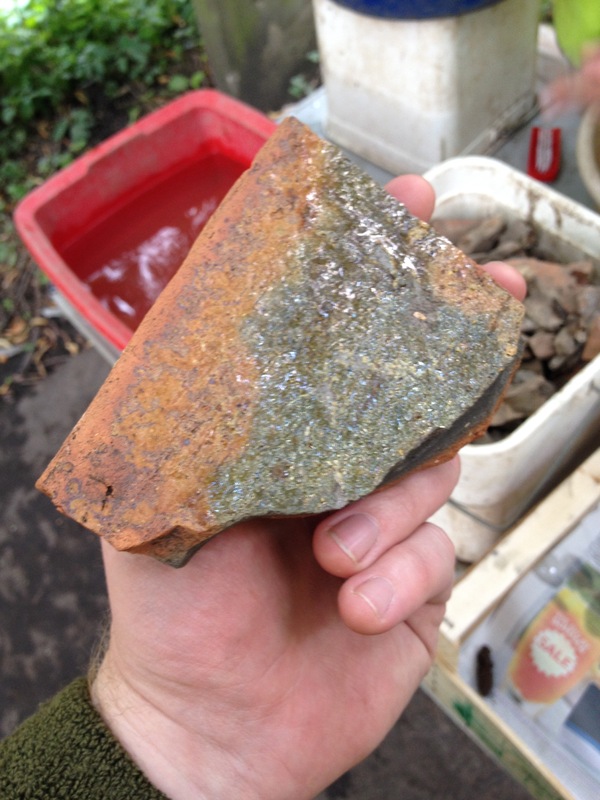 Could this material have derived from the levelling of part of the Roman rampart in the 11th or 12th century? Some medieval material was recovered, but the majority of the finds consisted of Roman material including painted plaster, pottery and glass. 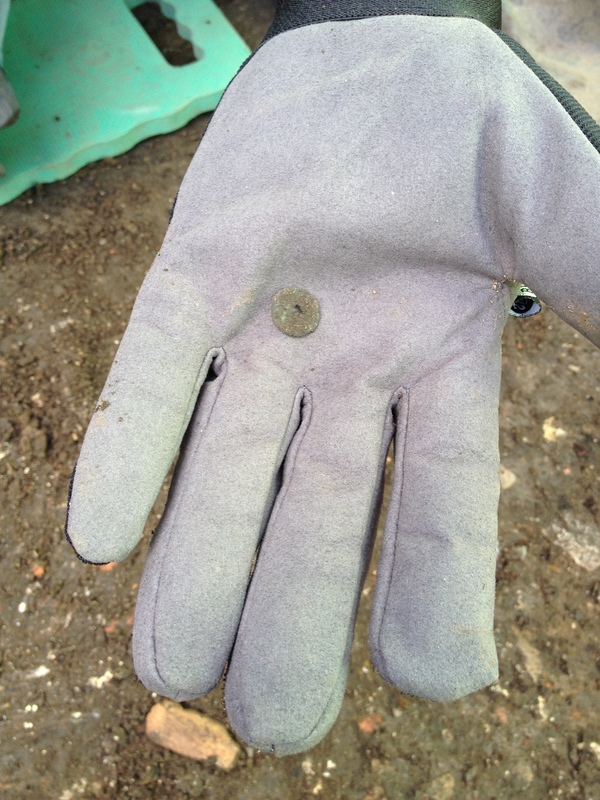 A shell bead and a very well preserved plated iron nail were also recovered. As work at the southern end of the site has concentrated within trench 1 this week, little progress was made in trench 4. Minor inroads were made into excavating out the backfills of the Time Team trench (1999) and trench 2 (2001) with fragments of tile, pottery and glass being recovered. Watch this space! This week the team has focussed on revealing the position, orientation and detail of a Victorian gravel path that sweeps across the excavation area in a north to south direction; the continuation of this path was excavated in Trench 3 in 2001. This would have been one of the principal routes through this part of the Yorkshire Philosophical Society’s Garden of Antiquities situated here in the late 19th and early 20th century. Cleaning up demolition deposits in the air-raid shelter. The path consists of a complex sequence of lensed gravel, clinker and mortar deposits edged during its later use by large limestone blocks. More of the latest path survived than originally thought, though it had been damaged to the west during the construction and demolition of the World War 2 air-raid shelter and subsequent landscaping. A great selection of artefacts recovered from the landscaping deposit that sealed the path dated from the prehistoric period (flint scraper/tool) to the relatively modern (Victorian hair clip and a modern pen-knife). 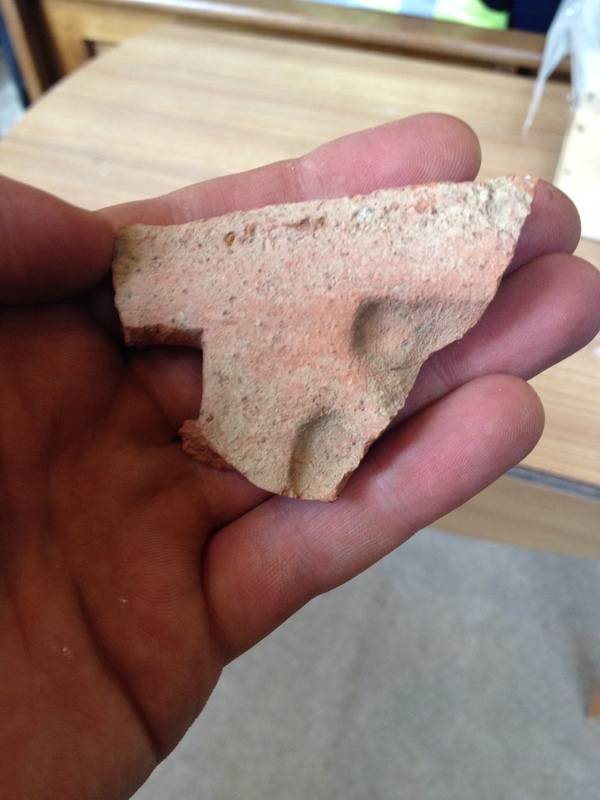 Fragment of Samian pottery recovered from trench 3 showing a running lion. This week was a quieter one for both trainees and visitor numbers perhaps relating to the fact that the schools go back soon. Visitor numbers were good, but considerably down, with 1,359 people viewing the excavations. The total number of visitors so far this season was just short of 14,000 by the end of the week. Even though the workers were few, enthusiasm was alive and kicking, and as a result, much was achieved. Excavation focussed, at last, on the rampart deposits at the southern end of the trench. These deposits were the only ones excavated so far this season that could definitely be Roman in date and character. Excavating rampart deposits in Trench 1. 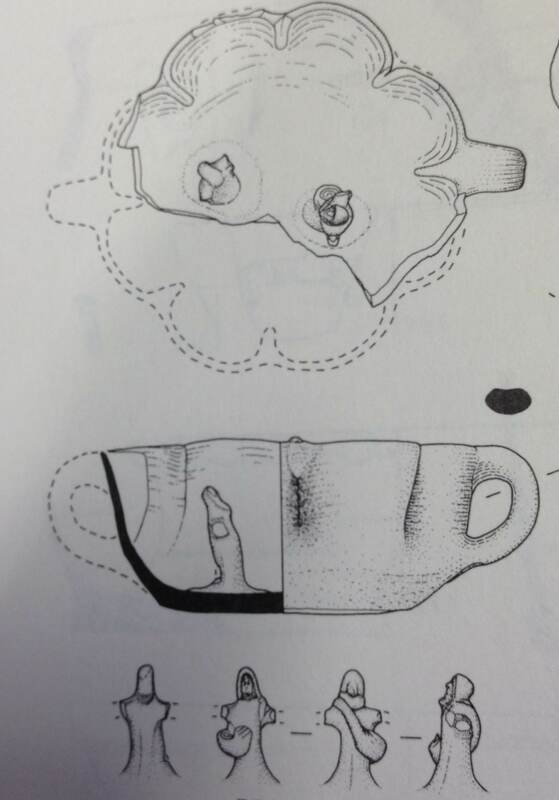 The rampart deposits consisted of a complex sequence of interleaved sandy deposits, heavily disturbed by animal burrowing, which were very difficult to excavate stratigraphically. The deposits were a revelation however, as they revealed that the interval tower SW6, rather than being built into an earlier rampart, was actually constructed first and the rampart piled up against it. This is the first time in the excavations history that we have revealed evidence to suggest this. Only a few artefacts were recovered from the rampart deposits including several sherds of York ware Roman pottery dating from the 1st or 2nd century AD. Dry sieving of archaeological deposits from Trench 3 to retrieve small artefacts. 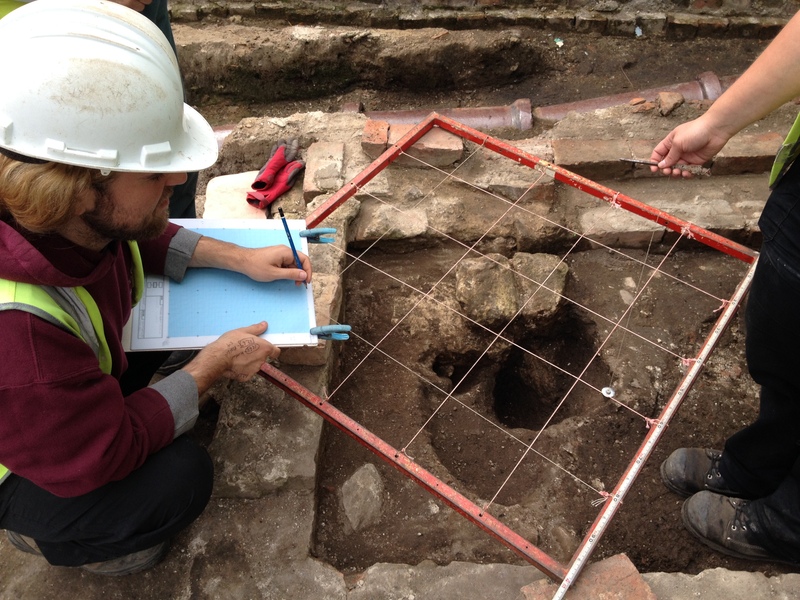 This week, a three pronged approach was used to tackle areas of archaeology in this trench. Firstly, at the west end after a thorough clean a large number of post- and stake-holes were revealed. This brought back memories of the 2002 season, when hundreds of these features were exposed and excavated at the eastern end of the trench. Luckily these were easily identified and dealt with rapidly. Checking records as the foundation pit gets ever deeper! 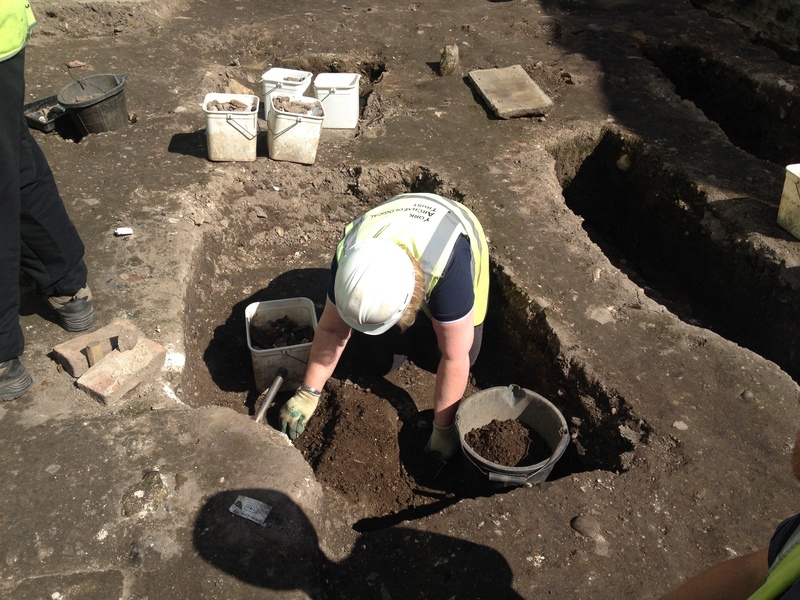 Secondly, excavation proceeded again within the central foundation pit associated with a column of the 13th century hospital undercroft (see week 5). Four pieces of medieval glazed roofing tile came from the deposits excavated from within the foundation pit as well as a glass melon bead. The foundation pit is now c. 1.7m deep and still going! Could the pit go all the way down into natural deposits? Excavating levelling dumps on the eastern side of Trench 3. The third prong involved the removal of further homogenous dumps at the eastern end of the trench. These again produced a nice array of finds dating mainly to the Roman period including glass, pottery and a coin, although we are fairly confident they are still 11th or 12th century in date. Within this trench, excavation focussed on excavating a slot through the backfill of trench 2 which we excavated in 2001. The top of the substantial 13th century drain revealed in 2001 was re-exposed at c. 0.40m below the present ground surface. Quantities of brick, tile and pottery were recovered as well as one half of a pigs jaw with an intact set of teeth including the tusk and incisors. Excavating deposits within the air-raid shelter demolition cut. 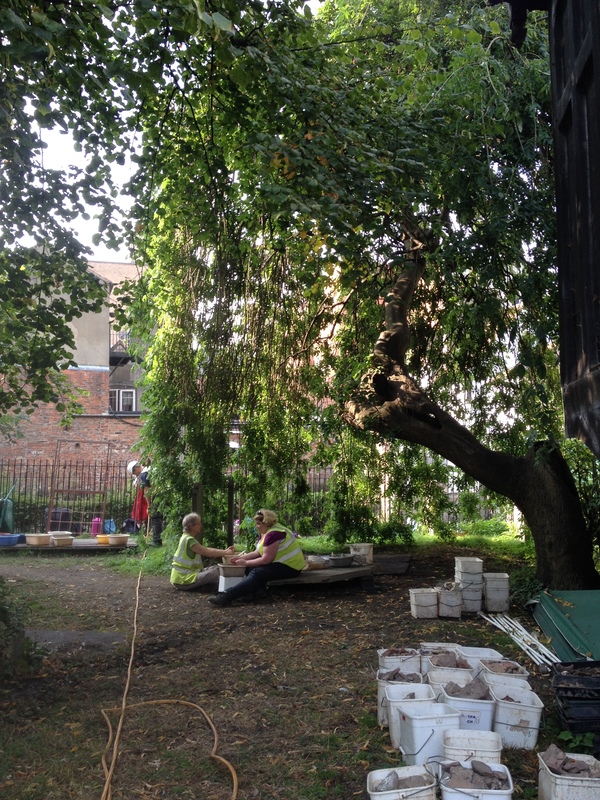 With fewer trainees this week, work focussed on cleaning the last of the landscaping deposits, discussed last week, off the gravel path within the Yorkshire Philosophical Societies garden of antiquities. In the process of doing so the true appearance of the path, during its last phase of use, perhaps in the 1930’s, was revealed. A narrow gully was exposed on the western side of the path, cutting through the latest of its surfaces, Could this have been dug to drain rain water off the path and into the deep landscaped area within the multangular tower? A fragment of a double-sided bone or horn comb, perhaps of medieval date was recovered from the landscaping deposits on top of the path. Here we are again, at the end of another busy, exciting and productive week. 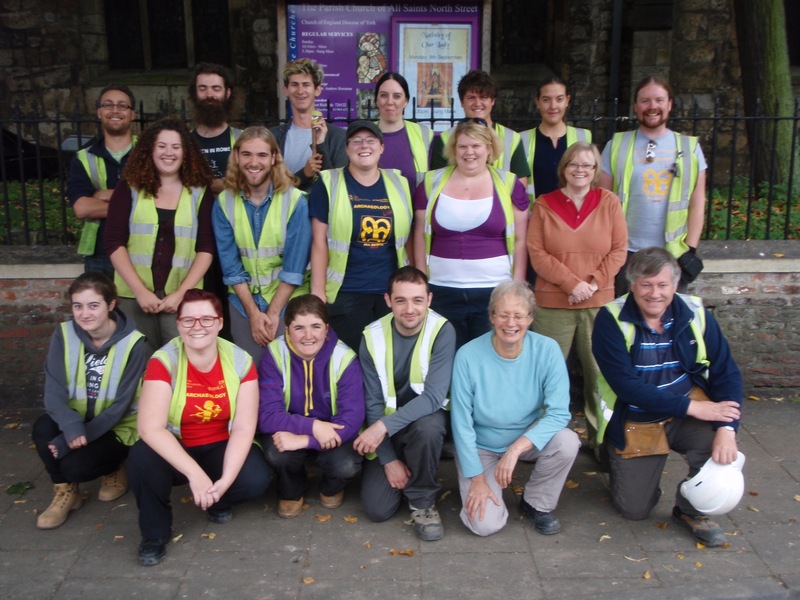 Trainees from all over the UK were given a thorough grounding in the techniques of archaeological excavation, within a deep urban environment, learning the skills of the archaeologist. Trainee numbers bounced back this week, with renewed vigour, which was very encouraging. Enthusiasm for the subject was, as always, running extremely high. Visitor numbers continued the trend of last week, with the end of the summer holidays for schools, only c. 1100 visiting this week, a far cry from the 2200 visitors in week 7. Still, we have had 15205 visitors so far this season, well up on the same time period last year. Excavation of rampart deposits in Trench 1. Excavation within this trench continued to focus on carefully peeling apart the individual layers that make-up the Roman rampart on the south-east side of the interval tower SW6. This has been much harder than expected, as the ground, due to its sandy nature, has been prized by burrowing animals in the past. Few finds were recovered from these deposits as they consist of small patches and layers of mostly redeposited sandy natural from the surrounding area. Flint flake recovered from the rampart deposits in Trench 1. Approximate size 15mm long. Carrying on from last week, dumps of material that were laid down to the north-east of the Roman rampart in the 11th or 12th century, continued to be excavated. These deposits are also proving tricky to peel apart. Looking south-west up the rampart. The dumps appear to have been thrown down the slope of the rampart from south-west to north-east in a rapid succession. As a deposit settles, material appears to scatter down the slope of the rampart, the edges of the deposit become blurred with the rapid build-up of further dumps that occurr above it. This creates difficulties in defining the full extent of a context, and also the definition of fresh ones. The dumps are fairly similar in colour, composition and character and therefore, as you can imagine, it is difficult to define one dumping episode from another. Digging deep at the north-east end of Trench 3! The top of an L-shaped cut was also exposed this week, truncating the sloping rampart deposits. Could this be an attempt to shore up the rampart with a wooden structure? An addition of a building to the rampart in Roman or Viking times? Or a slot to define a property, or boundary that ran up the slope of the rampart? Bone object, possibly a measuring spoon, bowl diameter c.18mm across. Further excavation may produce an answer as we investigate this strange feature further. All suggestions however can be posted via the web discussion rather than by postcard! Artefacts recovered from this trench this week included a possible bone measuring spoon of probable medieval date along with a selection of other finds dating from the Roman and medieval periods. Glass melon bead, 16mm across. New trainees were hard at it removing more backfill material to reveal the medieval drain within the previously excavated trench 2 (2001) this week. Two-thirds of this has now been exposed, with many finds being recovered from the backfills. In 2001 some of the modern deposits, such as the backfill of the 1940’s air-raid shelter, were removed by machine rather than being carefully hand excavated and sieved. Putting trainees through their paces in Trench 4! It is likely that the finds originate from deposits which were machine cleared or rapidly excavated with mattocks and shovels. It is impossible on any archaeological excavation to get 100% finds recovery, so this exercise is a good case in point. The percentage of recovery of artefacts from a deposit very much depends on the method of excavation used. An inticate sequence of interleaved paths, dating to the late 19th and early 20th century have been investigated this week. For many visiting members of the public, these deposits are what brings archaeology to life, as they can imagine men and women in Victorian garb parading along this path within the Garden of Antiquities. Further deposits within the air-raid shelter demolition cut have also been tackled this week, another feature on the site that stirs peoples memories and brings history to life for members of the public. Several copper alloy objects, perhaps part of a Roman vanity set, were recovered from this trench this week, along with a selection of other finds from Roman to modern times. The gravel path under excavation in Trench 5. “I dig it”, “The best £1 I have spent ever” and “Keep up the good work”; these are some of the many enthusiastic and encouraging comments that members of the public have left us in our visitor book this season. Some 16,500 people have seen the training excavation so far this year. We have been busy this week training a healthy number of module and taster trainees, most of whom originate from the UK but with a trainee from the USA. To hear about the challenges faced this week read on. A fantastic discovery made this week was the remains of a turf rampart, sealed by the material that was banked up against the back of the later Roman fortress wall. Could this earlier defensive feature date to 71AD when the IXth Roman Legion first arrived in York? Amazingly, it was still possible to see the individual turf blocks used in this early rampart’s construction, and although no finds were recovered this week, we are hopeful that further excavation may produce dateable finds from these deposits. Watch this space. Within this trench, the removal of the homogeneous dumps on the north-east side of the trench last week revealed a clay deposit which became much thicker to the north-east, thereby forming a level surface against the back of the Roman rampart. A single post-hole was associated with this levelled area. Could this be a flat platform for a building situated close to the rampart, or a yard or work area? In either case, this is the first evidence for human activity on the site between the Roman and medieval periods. It may represent the use of this part of the former Roman fortress as a hospital before the Norman Conquest – a Viking hospital! This really would fill in one of the blank spaces in York’s history; only further investigation will tell. The clay sealed the backfill of the L-shaped cut revealed last week, so the clay has been the focus of our work this week, as it was more recent in date. As most readers probably know archaeologists dig backwards in time, from modern times to the prehistoric, defining and digging each individual context and interpreting each event or activity as they are revealed by the excavation process. The clay levelled area contained a fragment of pottery that may date it to the 11th century. A possible hone stone and fragments of glazed roof tile were also recovered this week. Excavation continued within the backfill of the former Trench 2 (2001), virtually all of which has now been removed, exposing the medieval stone drain and previously unexcavated archaeological deposits to either side. Although we will not be able to investigate these deposits this season, we are already looking forward to tackling them next year. 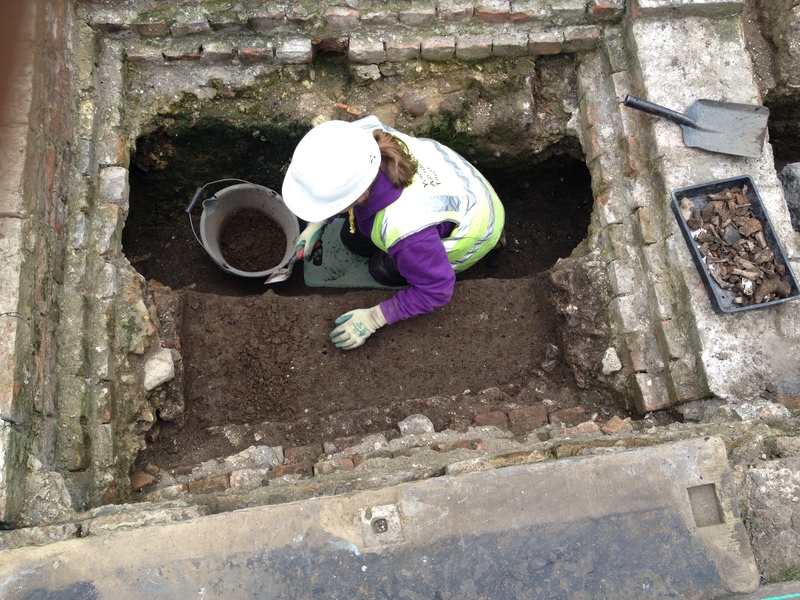 A hole, or sluice in the top of the medieval drain, was rediscovered this week. This may have been used to get rid of liquid waste from the kitchens, which were situated in the medieval hospital undercroft. 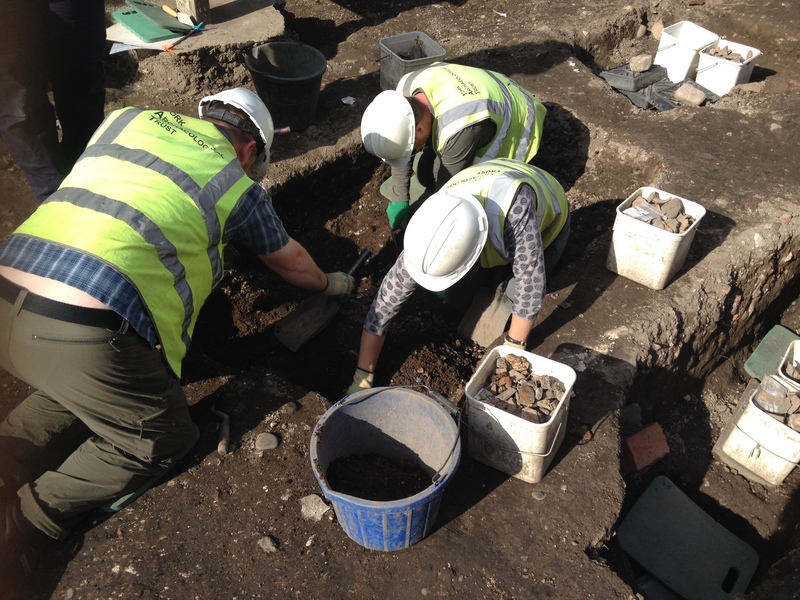 A wide selection of finds dating from Roman times to the modern period were recovered from the backfill of Trench 2 this week including pottery, animal bone and ceramic building materials (brick and tile). This week, work has been targeted on the Victorian path that sweeps across the trench from south to north. This would have been a route-way through the Garden of Antiquities maintained by the Yorkshire Philosophical Society in the 19th and early 20th centuries. The removal of a sequence of gravel paths last week revealed landscaping deposits and the construction point of the limestone edging stones, cut into an earlier path sequence. Once planned, photographed and recorded, the large blocks which lined the path were removed to reveal the full extent of an earlier path surface and landscaping deposits that pre-date the paths construction. Stay tuned to see what else is revealed below the path in weeks 11 and 12. How time has flown this year. It seems like only yesterday that we were exposing the medieval column base in Trench 3, and Trench 5 was but a twinkle in Toby’s eye. Since then we have excavated huge amounts of archaeological deposits, and the spoil heaps from these two trenches in particular are truly enormous. Joining the British trainees on the excavation and our second surveying course of the season were people from the USA and France. The survey course, led by Toby Kendall, got off to a cracking start this year with trainees undertaking a contour survey of the Victorian landscaping in the Multangular tower, and learning the skills behind archaeological surveying. At Acomb Grange (see Week 2), they learned the technicalities of geo-physical survey with Prof. Mark Noel of GeoQuest Associates, and found evidence that may tell us more about the medieval grange. Further survey work on-site resulted in the tying in of all of the trenches and the existing grid. A set of permanent markers were then installed, so that next year, the laying out of the grid and the trenches should be easier. Finally, they were trained by Jane McComish in the principles of building recording, identifying building styles and dating them and the recording of architectural fragments. 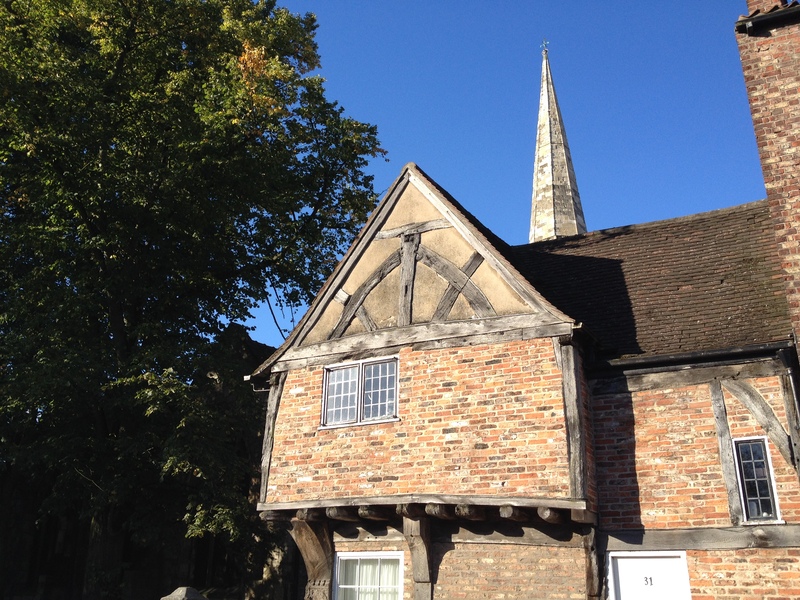 After which, on a tour of York, they were tested on their new found skills to date standing buildings within the city. 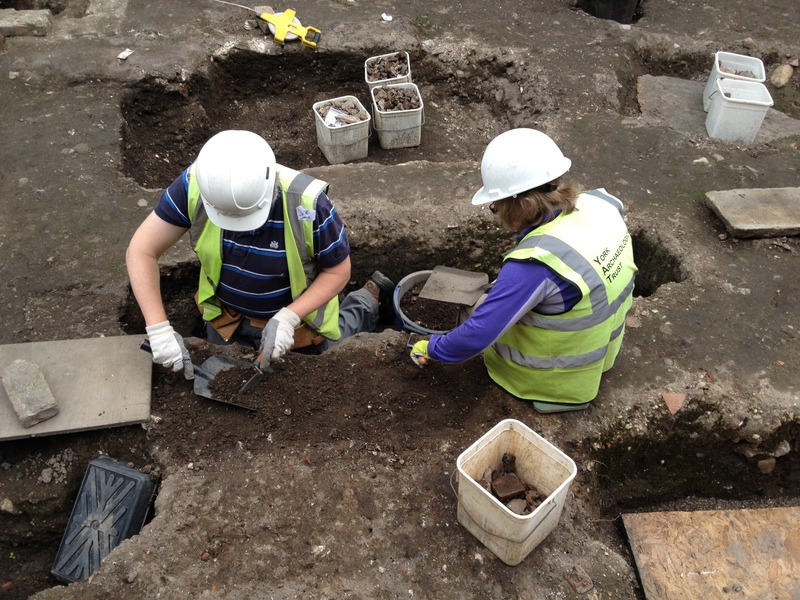 The final excavation act in this trench was to peel apart the early Roman turf rampart. No evidence for a cut through these deposits for the construction of the later Roman interval tower wall was found, giving the impression that these deposits had been laid up against the wall; but this would put them much later in the sequence. Instead, it is assumed that the concrete and rubble wall completely filled its construction cut and was therefore built up against the early rampart, leaving no sign of a cut. Except for a couple of tiny fragments of animal bone, no finds were recovered from this feature until a superb fragment of twisted glass vessel stem was found in the lowest of these deposits. 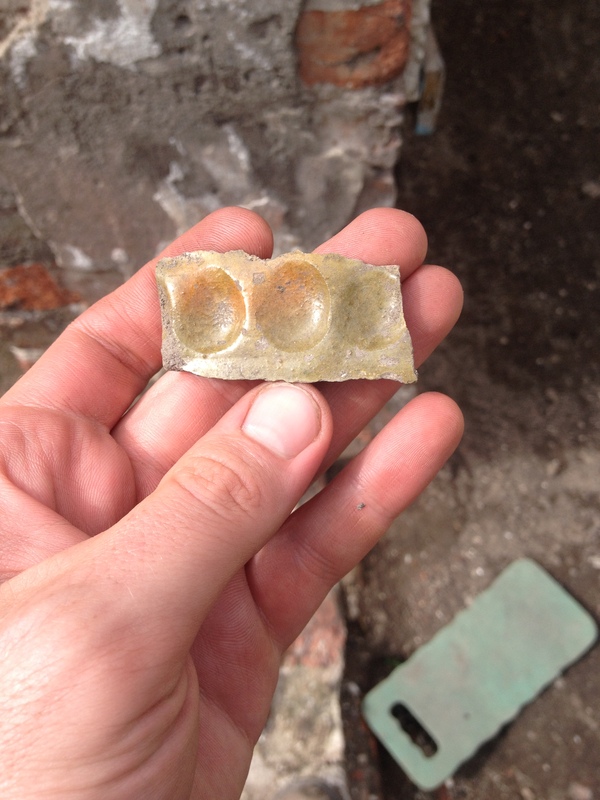 Could this be a fragment of an elaborate glass vessel or vase, brought here when the IXth Legion came to York? Hopefully its shape and style should mean that we can date it with some accuracy. After removing the 11th century clay feature last week, investigation has concentrated on further dumps of material below this which have been laid down to the north-east of the Roman rampart. Are these deposits of Viking or even Anglian date? The removal of the clay feature has also completely exposed the fill of the L-shaped slot first revealed in Week 9, and the latter is now under excavation. A rare fragment of marbled yellow Samian pottery of probable 1st or 2nd century date was recovered from deposits excavated this week as well as a Roman coin and a stone bead, which was recovered during environmental processing. When viewed from its north-eastern side, the rampart now looks extremely impressive and it is hoped to get some great photographs of this at the end of next week. As our efforts concentrated on the rampart deposits within Trench 1 this week, little has changed within Trench 4. However, the medieval drain has still been attracting the curiosity of many of the visitors to the site as it is one of the most visible and dramatic looking structures within any of the archaeological trenches at the moment. Attention should return to this trench next week. After the removal of the edging stones last week, an earlier path within the Yorkshire Philosophical Society’s Garden of Antiquities has been revealed. This appears to follow the same alignment as the later path, sweeping across the trench from south to north. The earlier path is composed of compacted layers of sand and gravel, with no evidence for a stone edging. Several deposits to the west of the path, associated with the early 19th century landscaping of the site, have also been tackled this week. One dark layer had been tantalisingly visible in the side of the air-raid shelter cut for some time, and is interpreted as a garden soil that was buried by later landscaping. A very shallow linear feature, cut into the garden soil, was difficult to interpret. 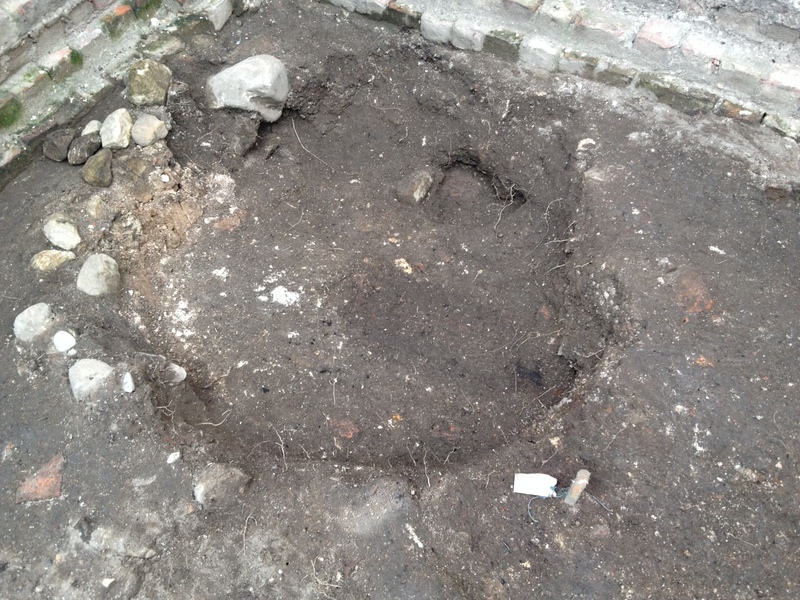 Could it indicate the position of a garden bed, or further antiquarian investigations into the site? Or, is it simply just where the passage of feet has worn a shallow hollow into the underlying deposit, as visitors to the garden took a short-cut off the gravel path down into the landscaped area within the Multangular tower? Further work at the north-west end of the air-raid shelter demolition cut revealed a fragment of the southern wall of the Multangular Tower where it projects back into the fortress. This is a very encouraging discovery, and it is hoped we will uncover more of this wall next season. The final week of a very successful season! A check of the visitor numbers showed that only a fraction short of 20,000 people visited the site this year – not including the repeated visits by squirrels, intent on hiding their nuts in our trenches. 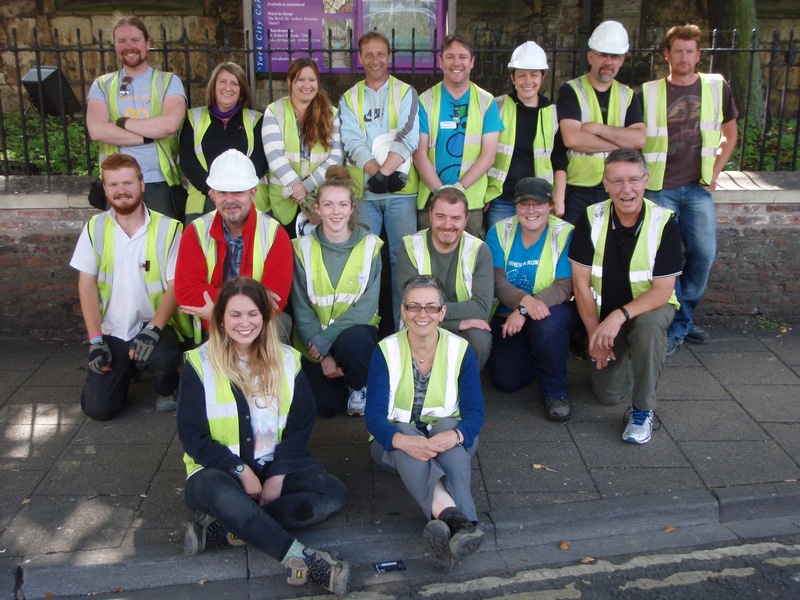 Far from being what we thought could be a quiet week on the excavation, perhaps an opportunity to tie up loose ends, we had another busy training and digging week – not to mention running our second artefact study course of the season. The artefacts students concentrated on the finds recovered from a group of dumps in Trench 3, thought to have been associated with the construction of the Anglo-Norman stone infirmary (see Weeks 8-9). After processing their finds and environmental samples, they carefully studied the whole range of material – from bricks to animal bone. 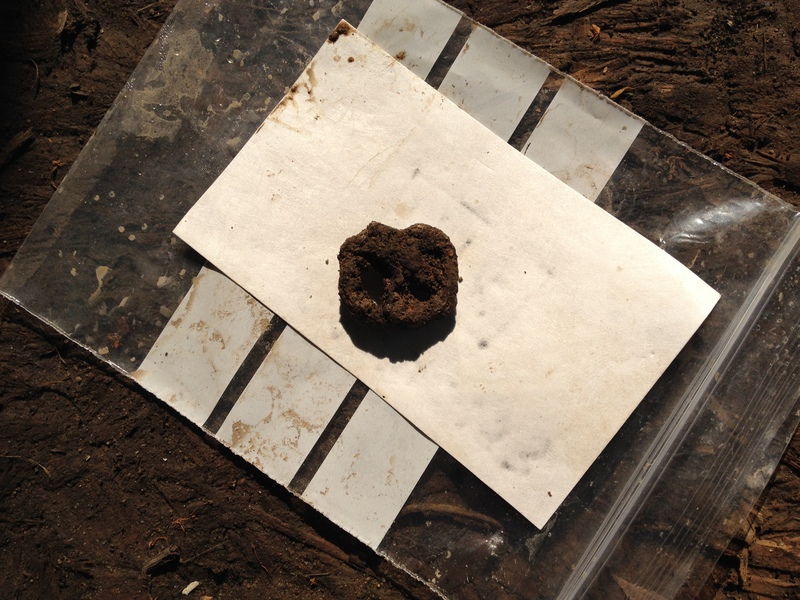 Their findings indicate that these dumps were derived not only from the demolished upper part of the Roman rampart, but also from contemporary domestic waste. This suggests that there was occupation nearby, and that the medieval builders had made use of any material to hand in order to form the flat surface for the construction of the infirmary. Snail evidence indicated that the dumps were occasionally left exposed for some time and dried out before the next layer was added, which suggests that the formation of these dumps was a prolonged process. 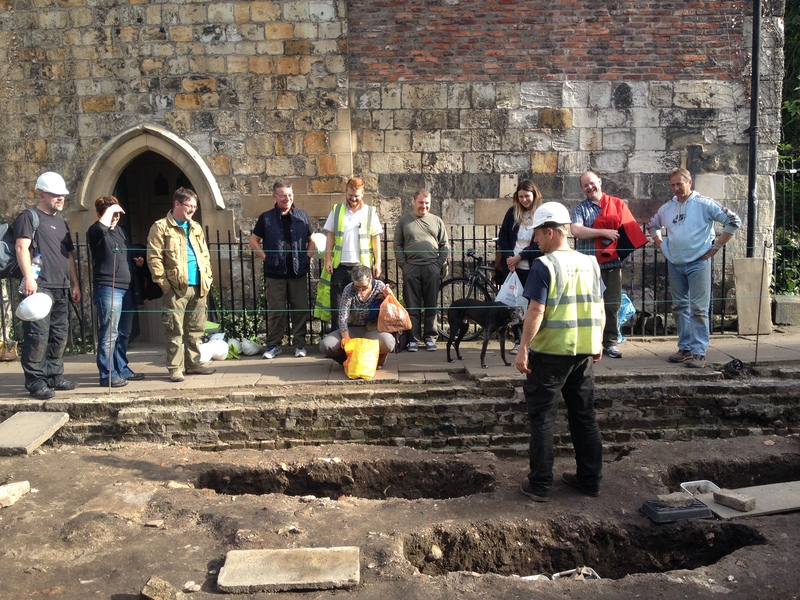 The information obtained from this course demonstrates how the thorough investigation of the full range of finds and other data available from urban sites such as St Leonard’s Hospital can greatly improve our understanding of the history of the site and its relationship to the wider social and economic history of York. Back to the trenches! All that was left to do in Trench 1 was to draw and describe the deposits and features as they were left when excavations in this trench ceased at the end of last week. In Trench 3 on the other hand, excavation was continuing apace, and there were some excellent developments here. To begin with, we were surprised when further excavation of the deposits at the base of the Roman rampart suddenly reached natural clay (the glacial material on which the city of York rests). These deposits, underlying the 11th century clay feature excavated last week, were not very thick, indicating that there was little activity in the area between the end of the Roman period and the 11th century. Another result of reaching natural clay at the north-east end of the trench means that we now have some idea of the amount of archaeological deposits that remain to be excavated down to natural in the rest of the trench next year. We were able to complete the excavation of the strange L-shaped cut in the top of the rampart. This feature had at least one post hole within it, suggesting that it originally supported a timber structure set into the rampart; our best guess to date is that this was a timber staircase that provided access to the fortress wall from the interior of the fortress. Even more intriguingly, some pottery from this feature could date to the Anglo-Saxon period, in which case this would be our best evidence so far for the maintenance of the fortress defences into the Anglo-Saxon period. Analysis of the pottery from this feature by a pottery researcher is eagerly awaited. Excavation in Trench 4 turned to the trench excavated by Time Team in 1999. This trench unearthed the entrance to the World War 2 air-raid shelter. However, a determined attempt to locate this feature was not successful, which suggests it lies deeper than expected. The examination of this part of the air-raid shelter will have to wait until next year. In Trench 5 excavation of a slot to examine the lower air-raid shelter fills concluded. To the north-east, a gravel path and landscaping deposits were encountered. They were presumably associated with the creation of the Garden of Antiquities around the middle of the 19th century. However, it is still not clear how extensive the Victorian excavations were in this part of the site; consequently, the extent of survival of the post-medieval and earlier deposits remains to be seen. Watch this space for more trips down memory lane! So it is that time again the 2015 T-shirt design is in place and we have it all ready to go. and ‘Dino’ coming out tops. If you are wanting to get one you need to get in touch with the guys at ZIK ZAK in York – http://www.zikzak.co.uk/ They can print onto pretty much whatever you want and in pretty much any colour….. There have been a number of eyewatering combinations in the past. Right then, back to setting up for next weeks start! Archaeology Live! has been opening up archaeological sites of national significance and offering professional standard training to people of all ages and backgrounds for fifteen years. 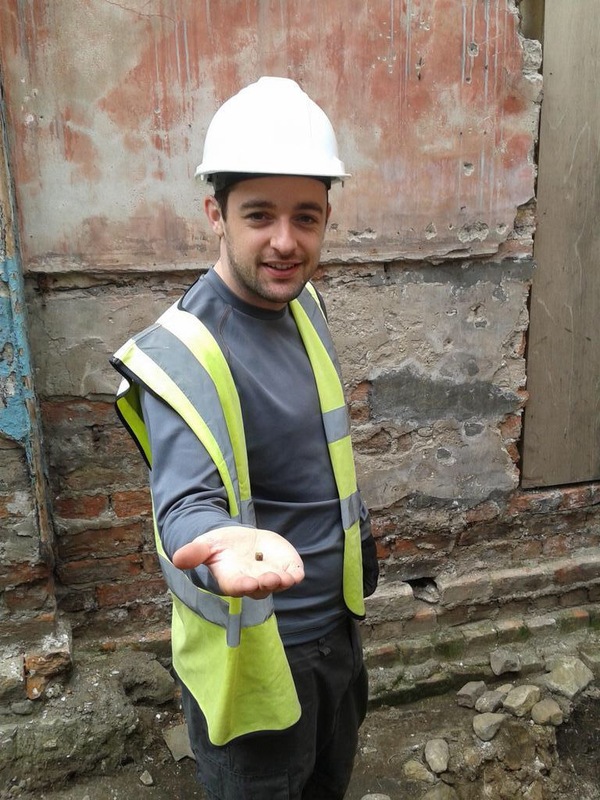 Over the years, our trainees have explored some of York’s most exciting archaeology and made some unbelievable discoveries. Full announcement to follow next week, we’re very excited about this one!! Sometimes, with a little research, tiny objects recovered from archaeological excavations can tell us amazingly detailed stories. This fairly unremarkable piece of fired clay is a fine example of an object with a tale to tell. 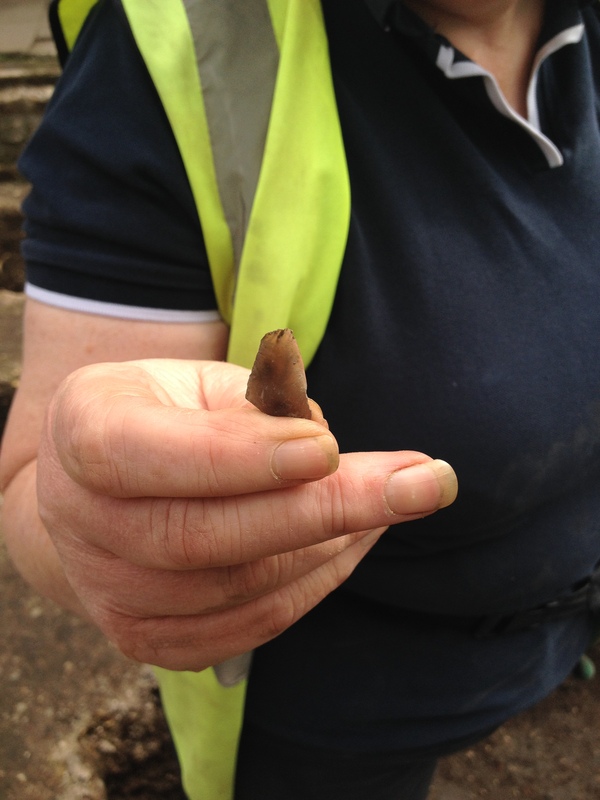 Discovered in July, during our excavation at All Saints, North Street, this fragment of a clay pipe bowl was one of many found over the summer. When it was cleaned, the team were delighted to notice that the object told us not only where it was made – right here in York – but also when, as it was stamped with the year 1828. If all artefacts were so free with their provenance, us archaeologists would quickly be out of a job! While this level of detail was an unusual and somewhat fortunate find, the story doesn’t end there. Sufficient detail of the stamp is visible to actually relate the object to an individual person and to tell us a tale of a father, a son and a stolen idea. In 1792, George Mason of York began a seven year apprenticeship in the manufacture of fired clay tobacco pipe under the tutelage of master craftsman Mark Hesp. At the turn of the century, Hesp produced a batch of pipes with a decorative shield motif and the text ‘HESP YORK 1800’. 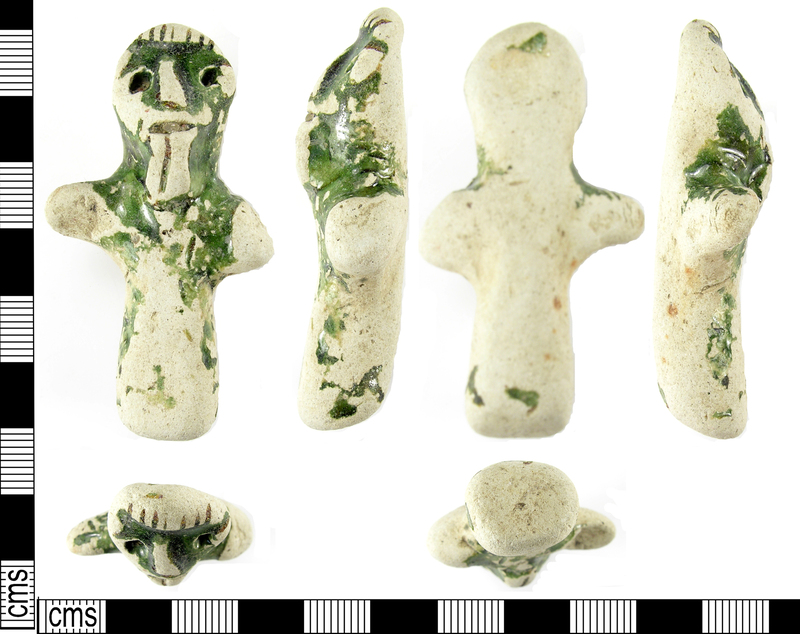 His pipe marking the new century must have proved popular, as numerous examples have been found in excavations across York. By the 1820s, the young apprentice George was in business for himself, producing clay pipes in a premises on Monkgate in central York. In 1828, he produced a batch of clay pipes that have also been found in sites across York. 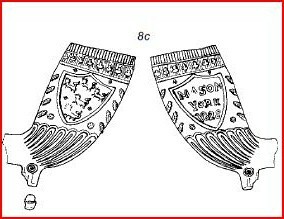 The shield motif featured on the pipe bowls was almost identical to the one created by Hesp 28 years before, although the text now read ‘MASON YORK 1828’. On the opposite side, the York city crest was pictured – clearly indicating a degree of civic pride. An example found in the Hungate Block D excavation in 2007 shows us how the whole pipe would have looked. The complete pipe bowl. 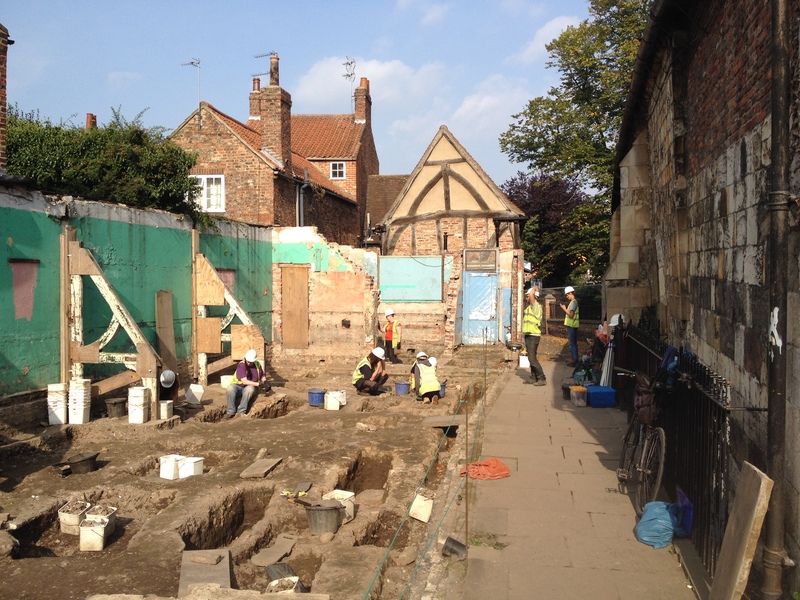 Image copyright York Archaeological Trust. 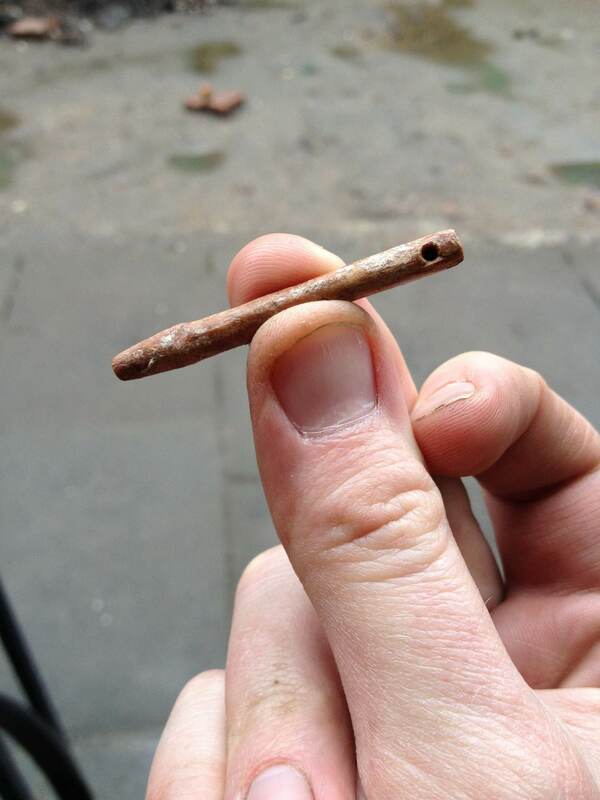 The exact significance of the years 1828 and 1848 remains unknown, but it is nonetheless wonderful to be able to relate a tiny fragment of clay pipe found at All Saints to a Victorian family business that certainly didn’t mind ‘borrowing’ ideas. That, in a nutshell, is the joy of archaeology; extracting the personal stories from the objects that we discover in the ground. The All Saints excavation fires up once more in April, we can’t wait to get back on site and will post regular updates right here. The votes have been counted, the expert panel of judges (well, Toby, Arran and Gary) have debated and the winner of the inaugural Archaeology Live! Find of the Year award has been decided. Despite facing stiff competition from some stunning finds such as an ornate Viking spindle whorl, an incredbly delicate glass ring from the Roman period, two medieval bone die and some beautiful, highly symbolic medieval and post-medieval pot sherds; the artefact lovingly referred to as ‘Dino’ has come out on top, with 42% of the public vote! 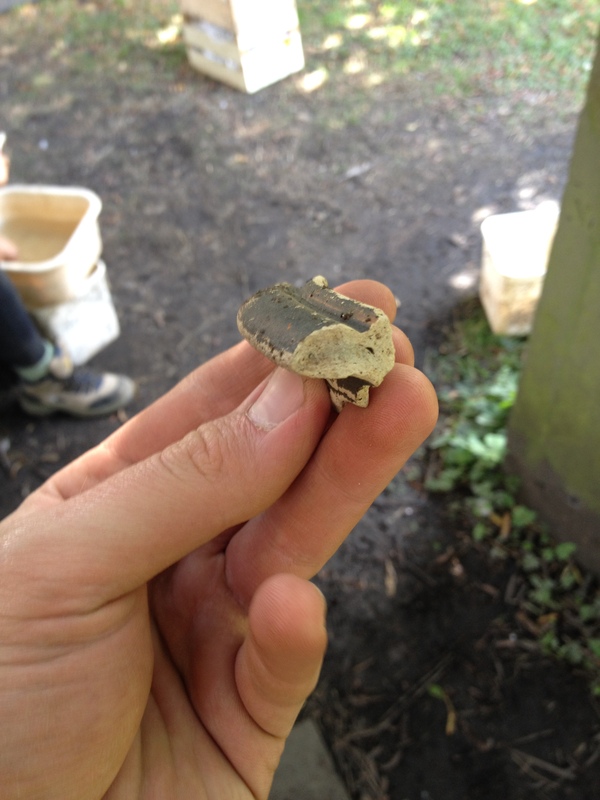 Found in July 2014 by Katie Smith, a familiar face on Archaeology Live! 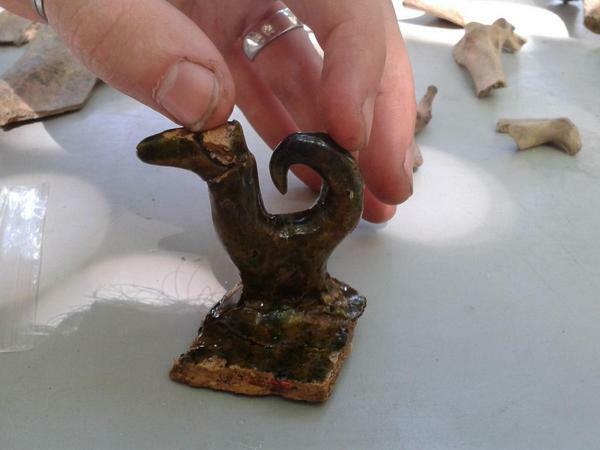 excavations, this object was discovered in the backfill of a post-medieval refuse pit. Dating to the 15th century, it is a fragment of a Hambleton Ware lobed bowl, a drinking vessel that combined old traditions with new technology. Lobed bowls were popular from the late 14th to early 16th centuries and were a continuation of the bawdy old tradition of communal drinking, where large bowls of delightful libations would be passed around groups of merrymakers. Originally, these vessels would have mainly been made of wood, however, as ceramic manufacture became more affordable for the middle classes, bowls such as these began to replace the older wooden vessels. As the decades passed, they became increasingly elaborate, with figures of mythical creatures, people and animals set within the bowls. As the contents were imbibed, the figures would slowly be revealed. 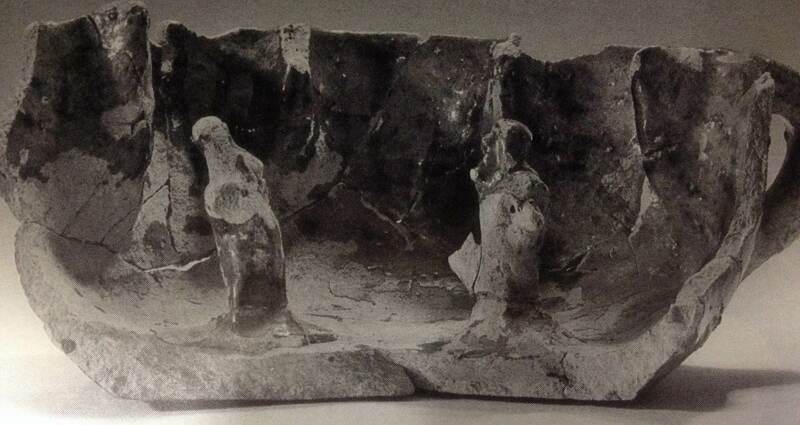 Examples such as this one, found at 1-5 Aldwark in 1976 feature two human figures seemingly deep in conversation. The identity of these figures may never be known, but wonderfully impractical objects like these invite us into the minor rituals of domestic medieval life. 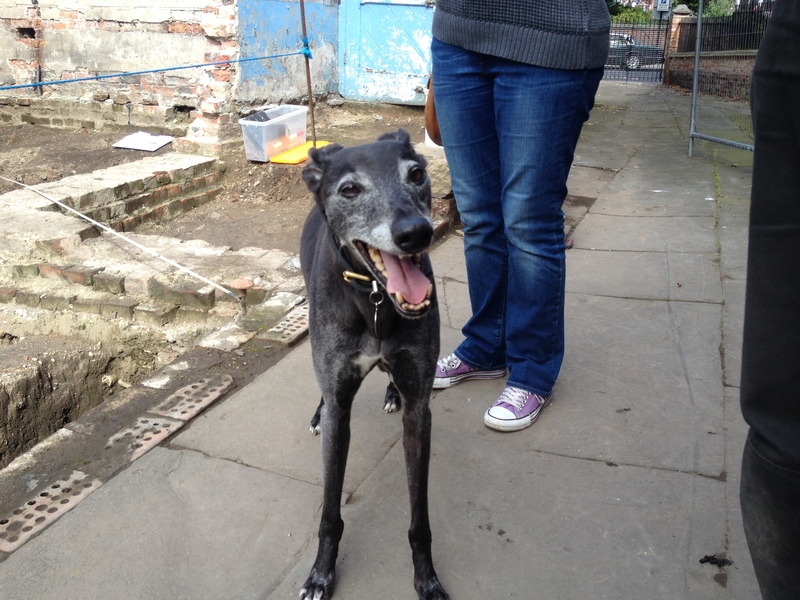 Katie’s figure, despite it’s somewhat dinosaur-esque appearance, may be a stylised cockerel or dog. Perhaps it could be a mythical beast from some allegorical tale of the 1400s. Specialist analysis in late 2015/early 2016 may finally reveal Dino’s true identity, but it remains open to debate at present – which is, of course, half the fun! Who/what ever the figure turns out to be, Katie’s find remains a wonderful insight into a more playful side of medieval life and highlights the wealth of symbolism and imagery that would have been commonplace at the time. While we can never know what merriment Dino may have bourne witness to, we can at least hold the very same object six centuries later and allow ourselves to imagine. Such objects bring us closer to the everyday people of medieval York and this is a deserving winner. Katie’s fantastic Hambleton pot sherd. Toby will start work on the T-shirt design in time for the spring training excavation in April, where the race begins to find the most exciting find of the 2015 season. 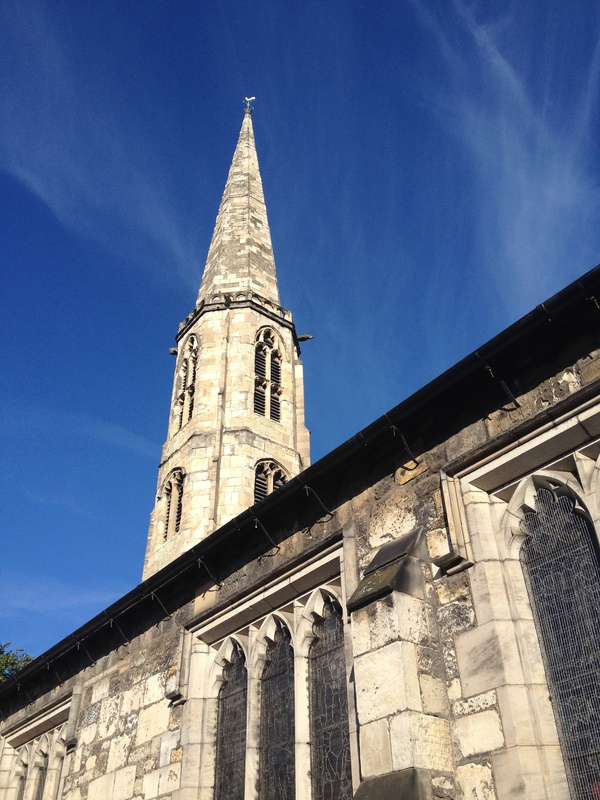 What wonderful objects and stories remain buried around the ancient church of All Saints, North Street? Join us in the spring to find out! As the old cliche goes, onwards and downwards! We are pleased to announce that we’ll be opening our excavation up to the public for site tours on July 18th as part of the 2015 Festival of Archaeology! Working in conjunction with our hosts at All Saints Church, this will be an opportunity to explore the trench, meet the archaeologists and see the latest finds. 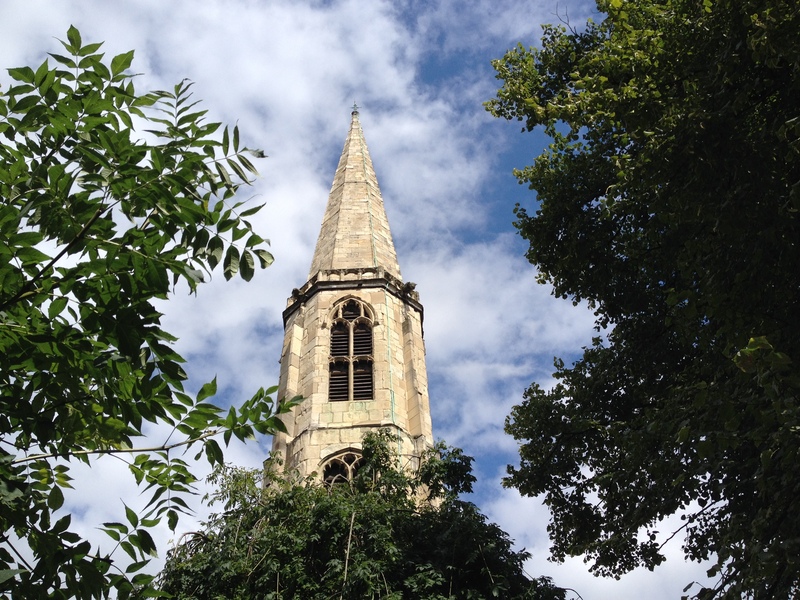 There will also be tours of the church that will provide fascinating insights into its history, architecture, archaeology and its nationally important stained glass. This will be one of many events taking place across Britain to celebrate our archaeological heritage. 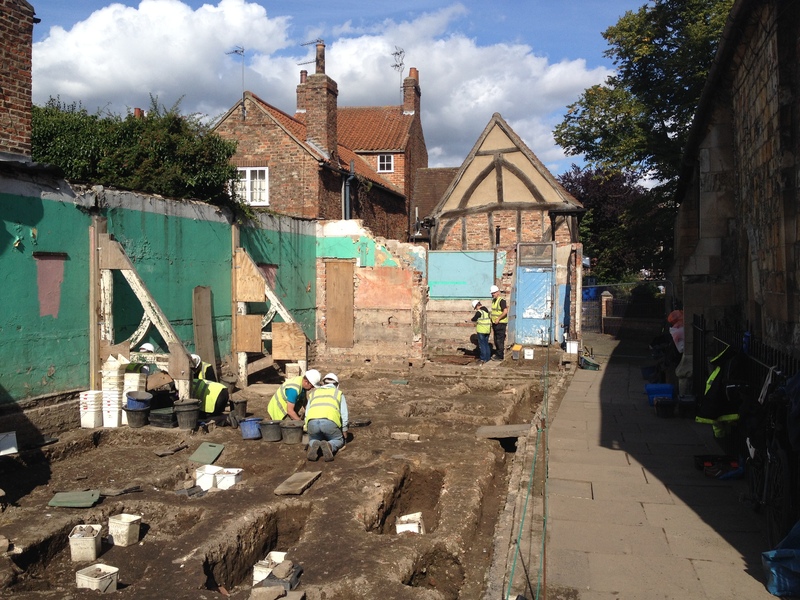 The open day will be a chance to see behind the scenes of an archaeological excavation and to learn about the countless stories and events from this small corner of historic York. On top of all this, the church will be holding a medieval mass at 2pm. This is an opportunity to experience what would have been central to the lives of the medieval people of York, almost exactly as they would have seen, heard and even smelled it! 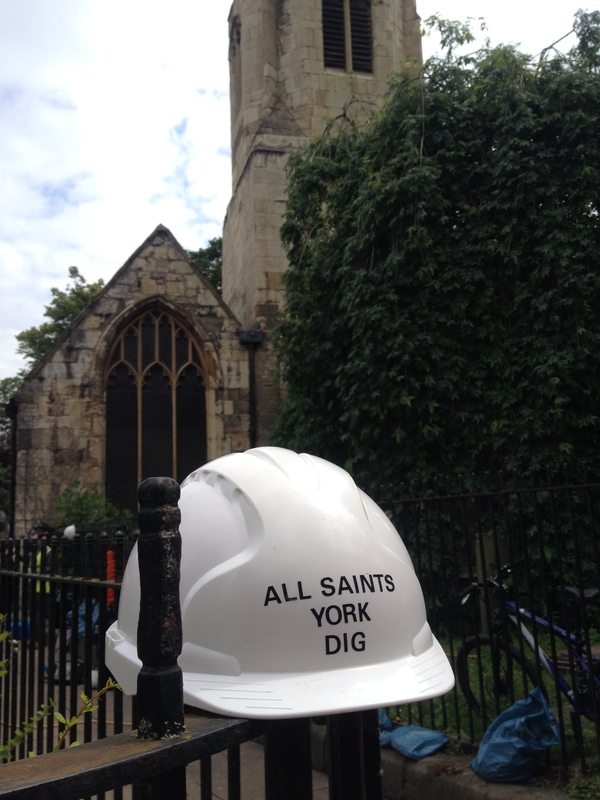 The trench will be open between midday and 4pm, times for the church tours will be announced in the near future. People of all ages are welcome and the trench is fully wheelchair accessible. 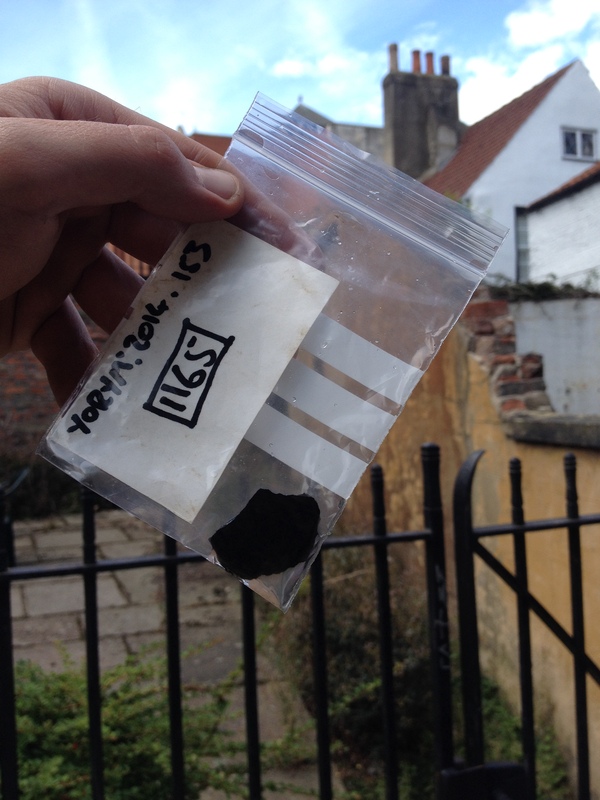 A freshly unearthed medieval lead weight. Summer 2014. A medieval miscellany… Medieval finds highlights from Archaeology Live! 2014. 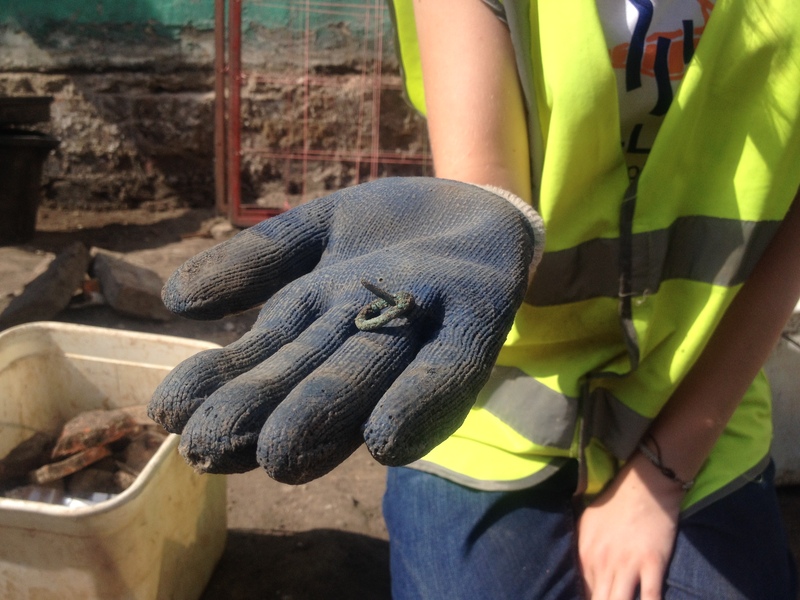 Last week, we took a closer look at some of the Roman finds that were uncovered during our 2014 excavation at All Saints, North Street. By the end of the season, we had excavated over two centuries worth of archaeology and uncovered deposits dating to the late 1700s. 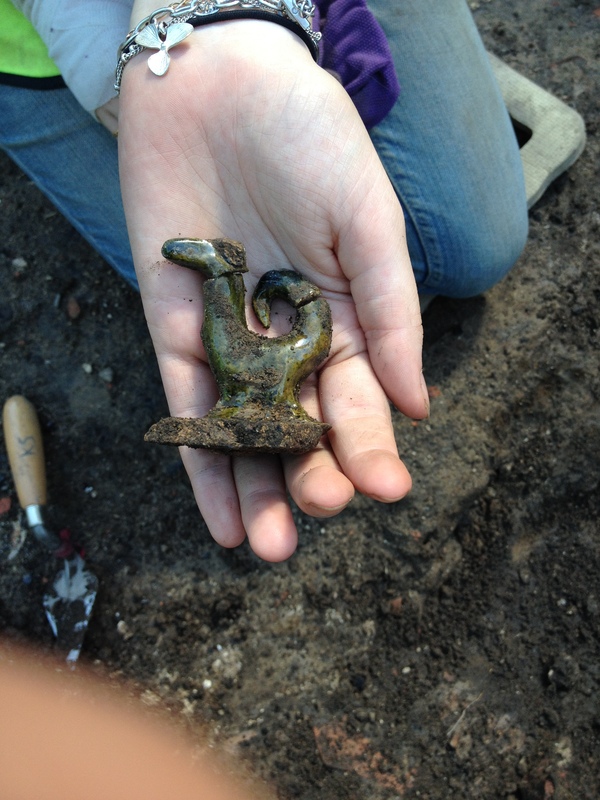 A wonderful thing about urban archaeology is the variety of finds that it provides. As our site has been in constant use for two millennia, a wealth of earlier material can be found re-deposited in later contexts. The sheer volume of re-deposited Roman material uncovered so far strongly suggests that intact Roman archaeology is present at All Saints, buried beneath countless layers of later activity. The 120ft spire of All Saints adds a touch of drama to the beautiful 14th century All Saints Cottages. While we can only interpret so much with finds from secondary contexts, we can still get a thrilling sneak preview into the Roman world beneath our feet; with glimpses of legionary tile production, imported luxuries like wine and oils and evidence of high status buildings, jewellery and ceramics uncovered already. These artefacts are exciting, but they remain only echoes of a landscape that has since been radically and irrevocably changed. With one or two rather stunning exceptions (i.e. the Multiangular Tower in the Museum Gardens), York’s wonderful Roman heritage is now entirely below ground. When we consider medieval York, we are lucky enough to be brought a little closer to life in the Middle Ages by the wealth of medieval architecture that still stands today. It is easier to visualise and understand a lost world, when you are able to see fragments that have survived the intervening centuries. A 15th century time traveller visiting our site today would see a lot that they would recognise. The magnificent church tower was completed in 1410, and the beautiful cottages pictured above were under construction in 1396. While they would see a world much changed, they would have reference points with which to orientate themselves. The remains of York’s medieval cityscape allow us to share experiences with people who lived centuries ago; an experience that is made even richer when we discover the objects that these people owned and used. Archaeology is all about adding flesh to the bones of history. The lives of kings and queens are well documented, but archaeology allows us to learn more about people like ourselves. At All Saints this year, we have been lucky enough to find an array of medieval objects that add more of these wonderfully personal details to our knowledge of medieval York. These finds aren’t always particularly glamorous, but they do tell a story to anyone who cares to listen. 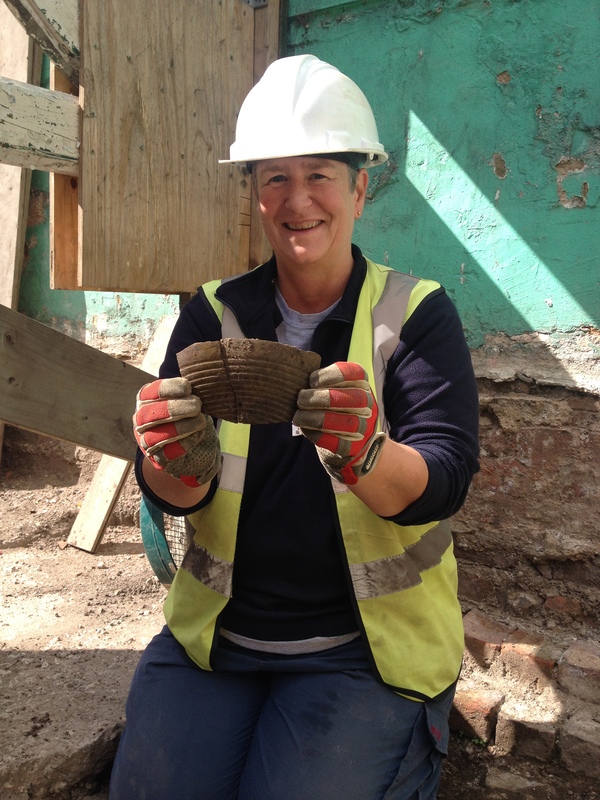 Joan and a large fragment of a medieval vessel. The medieval world was alive with symbolism and meaning. Medieval parishioners of All Saints would have often seen religious processions making their way along nearby Micklegate, with priests and visiting dignitaries arrayed in rigidly defined hierarchies. The allegorical tales of the mystery plays would have been imbued with far greater meaning to those of a medieval mindset than can be appreciated by you or I in the 21st century. This was a world where monsters and evil spirits would have seemed very real and the threat of hellfire and damnation weighed heavy on every mind. But these layers of tradition and symbolism were not limited to the glorious stained glass and monumental architecture of the church, they also appeared in everyday life. 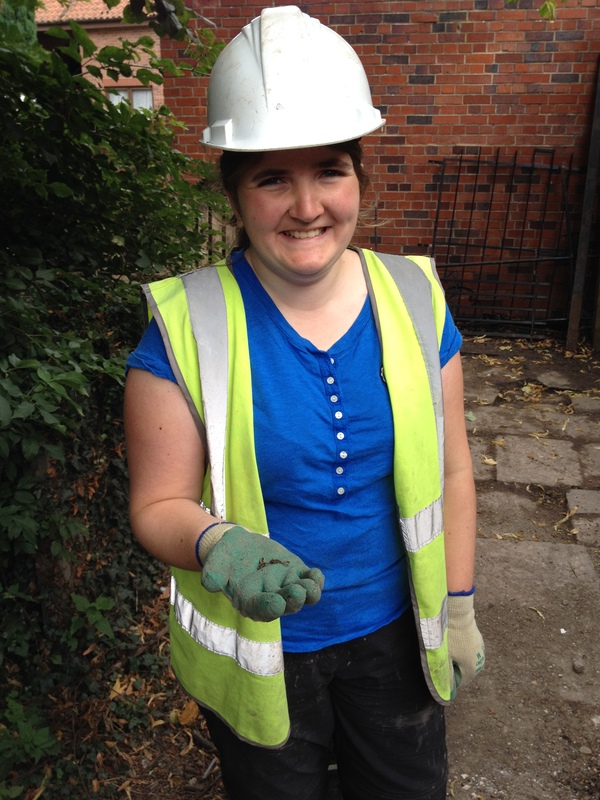 Joining us for her third season of Archaeology Live!, Yorkshire lass Katie made a particularly wonderful discovery when she spotted something green in the fill of an 18th century refuse pit. The object proved to be a sherd of Hambleton ware, most likely dating to the early 15th century (this date will be tightened up following a specialist assessment of the ceramics). It was immediately apparent that this was an unusual find. Unlike the numerous utilitarian fragments of bowls, jars and jugs that had already been found, this pot sherd was clearly a more decorative object. 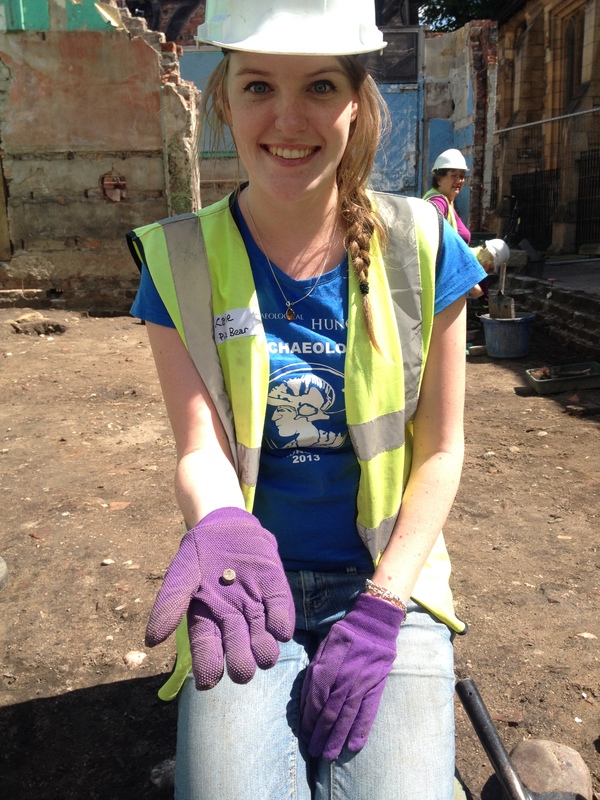 Initially thought to be part of an elaborate lid, a spot of research has revealed Katie’s find to be a fragment of a lobed cup or bowl. These lobed bowls were popular in the 14th and 15th centuries, being used as communal drinking vessels that would be passed around a group of people. As the contents were drank, figures of mythical creatures, biblical characters and animals would emerge from the liquid. This period saw a nationwide shift in material culture; drinking vessels which had mainly been made of wood up until this point were now occurring more frequently in ceramic forms. However, it seems that older, communal dining traditions were being maintained, as these lobed bowls remained popular into the early 16th century. Pictured below is a charming example of a somewhat eroded, but clearly human figure from a similar vessel. Image copyright The British Museum. 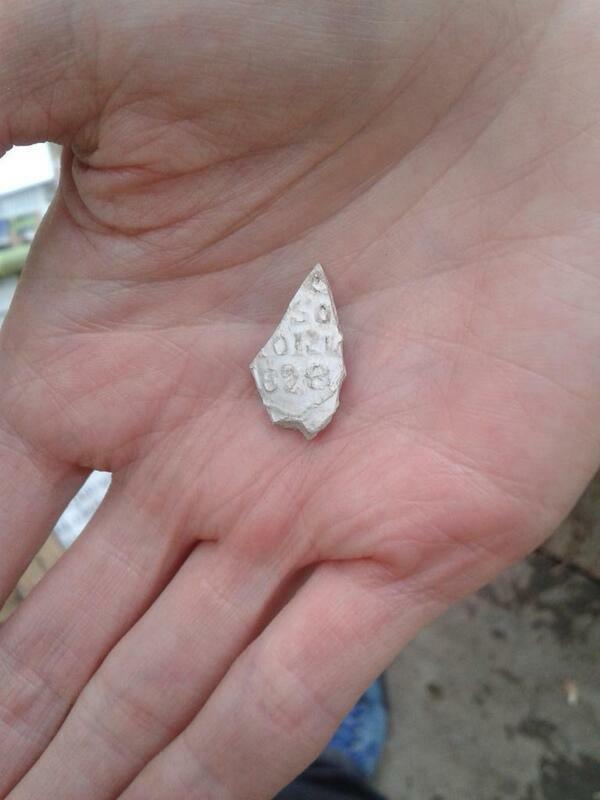 While Katie’s pot sherd will remain enigmatic for now, it can certainly be agreed that it is a wonderful find. Whether it was used during celebrations or ceremonies (or both!) is an entertaining question to ponder. This find has a certain frivolous charm, allowing us a glimpse into this medieval world of mystery and symbolism. It reminds us that life in the middle ages could have a more jovial side, which gives a warm contrast to All Saints air of piety and devotion. Joining us for his fourth season of Archaeology Live!, Barry didn’t waste any time in adding a new piece to our medieval puzzle. 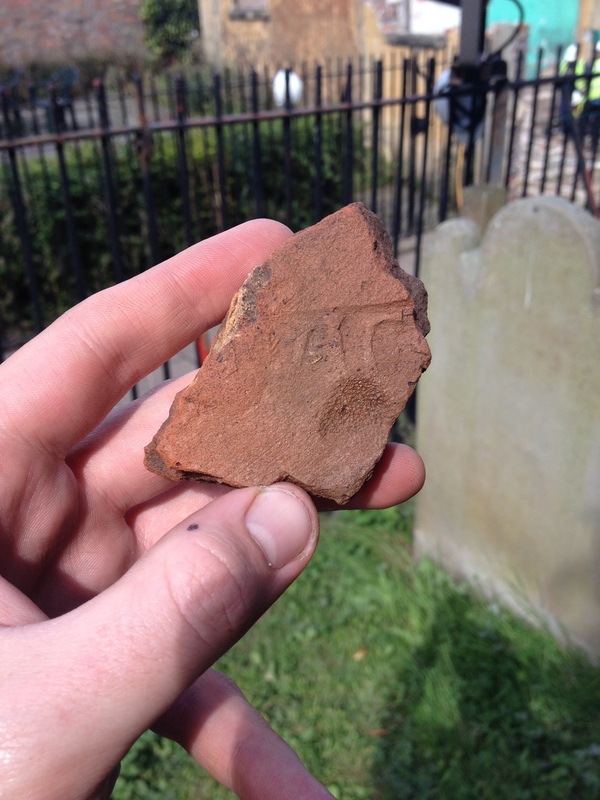 In a deposit associated with the 1860s church hall, he noticed a sherd of medieval pottery. At first glance, there was nothing immediately remarkable about this find. However, now we are learning to decode the imagery of medieval York, it is possible to find a very personal story behind this artefact. Barry and his medieval seal. 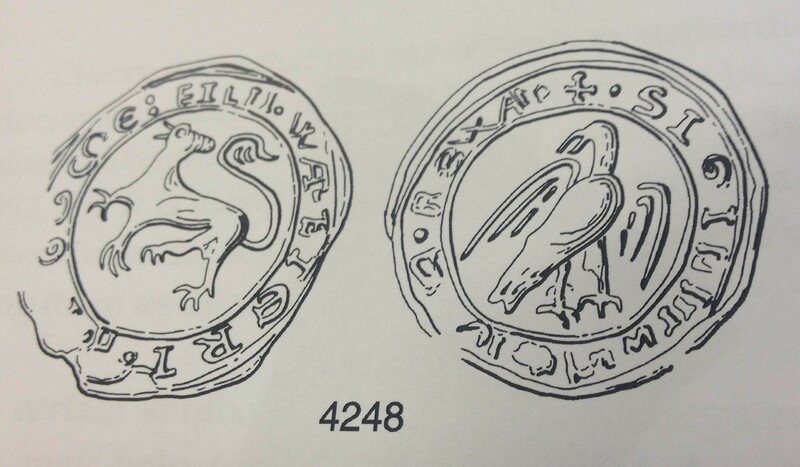 In the 11th century, carved bone or metal seal stamps came in to common use. These stamps were used to create impressions in wax to authenticate documents with a recognised seal, a tradition that had become firmly established by the 13th century. While medieval potters were somewhat lower down the social scale than those who created beautifully illuminated manuscripts, they were nonetheless influenced by the religious and heraldic symbolism that surrounded them, particularly in their parish churches. This influence of medieval symbolism on the ceramic tradition is something that we can clearly see in the archaeological record. 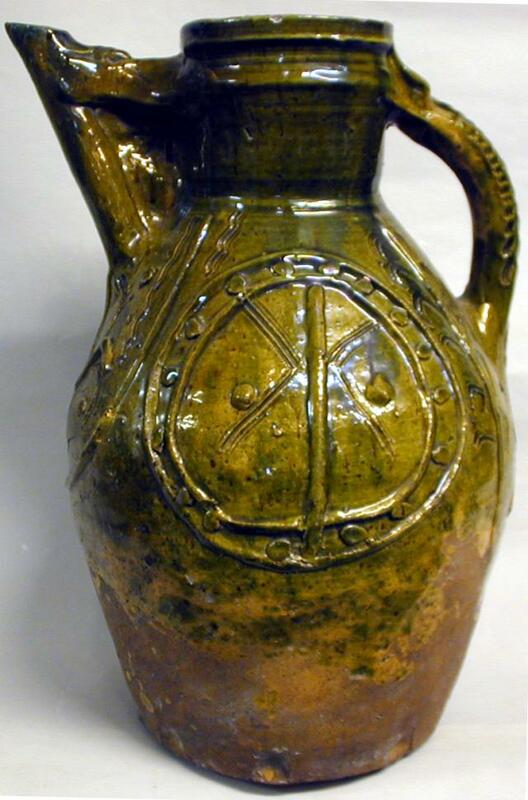 In York, the 13th century saw an influx of seal jugs; vessels that featured at least one applied cirucular motif. A reflection of imagery seen on documents, high status metal vessels and in church architecture, the seals on these jugs fall into three broad categories; personal seals featuring the owner’s name, seals containing the maker’s name (medieval branding if you will) and those with motifs of animals, floral decorations and anthropomorphic images. A complete medieval seal jug from the Yorkshire Museum collection. The variety of seals that have been found on these jugs suggests something far more complex than simple decoration. As we have discussed, medieval people were far more in tune with the significance of the myriad images and symbols that punctuated their world. These jugs clearly carried social, cultural, religious and political messages, as well as being beautifully crafted objects. Barry’s sherd is a perfect example of this tradition. A closer inspection of Barry’s sherd shows that we have the majority of a seal bearing the image of a bird. The stretched legs and raised wing create an image of imminent motion; our bird seems ready to take flight! Around the perimeter of the seal is a worn, but visible legend. At a glance, YAT ceramics specialist Anne Jenner instantly recognised the significance of this seal. 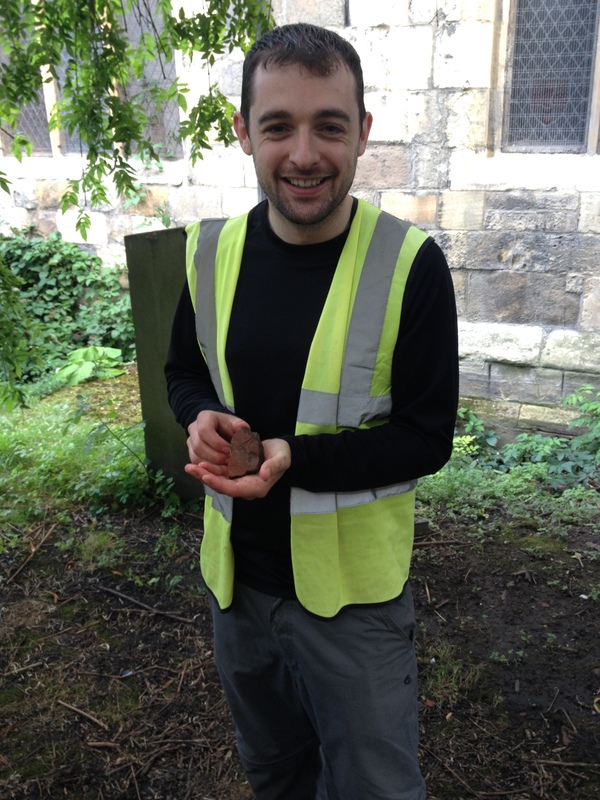 Fragments of identical and similar seal jugs have been found at Wellington Row, Micklegate, Coppergate, Low Petergate and as far afield as Gilling East and Wharram Percy. Clearly, Barry’s vessel was one of a batch that would go on to spread across York and North Yorkshire. Comparison with the more complete examples reveal this to be part of a jug with two bird seals on one side, and two featuring a lion on the opposite side. The lion is a ‘lion passant’ with its head looking back and its tail upright. Around the image of the lion is the text, “S. TOME:FILLI:WALTERI”, while the the bird is surrounded by the legend, “SIGILL.TOME.P-WA”. The survival of these seals means that we can actually link Barry’s pot to a particular individual, a very rare occurrence in archaeology! A lion passant (left) and a complete bird motif (right). 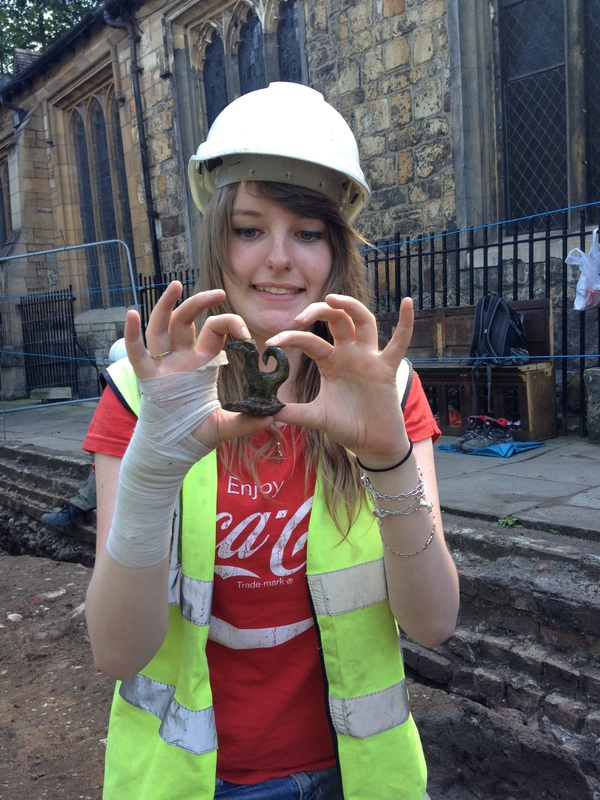 Image copyright York Archaeological Trust. The images above bear the personal seal of Thomas FitzWalter, a member of one of York’s more prosperous medieval families that are known to have been patrons of the arts. Historic records for the FitzWalters in York are scant, but the imagery of these seal jugs leave us with some tantalising possibilities. The fact that the legends contain a ‘P.’ (Pater, or father) and ‘FILII’ (son) over two separate seals could suggest that these jugs were commissioned to celebrate a marriage and the birth of a son. The widespread nature of the vessels may represent them being given as gifts, or becoming dispersed family heirlooms. The cross above the head of the bird acts as both a grammatical indication of the legend’s beginning and a symbol of religious devotion, adding yet another layer of meaning to the seal. Whatever the case, Barry’s find is a wonderful example of how archaeology can bring us closer to the past. Holding the vessels that people would have drunk from is always exciting, but being able to tie them to particular individuals is a rare and wonderful pleasure. Further research may yet reveal more about this fantastic artefact, but for now we can enjoy being very late guests to the FitzWalters’ happy day. A recurring theme of the 2014 season was objects featuring fingerprints. While this is not uncommon in ceramic objects from busy, urban sites, it is always highly evocative. Placing your finger in the mark left by the person who made the object you are holding many centuries ago is a vivid experience. It reminds us that archaeology is the study of people, not just sweeping historic events. 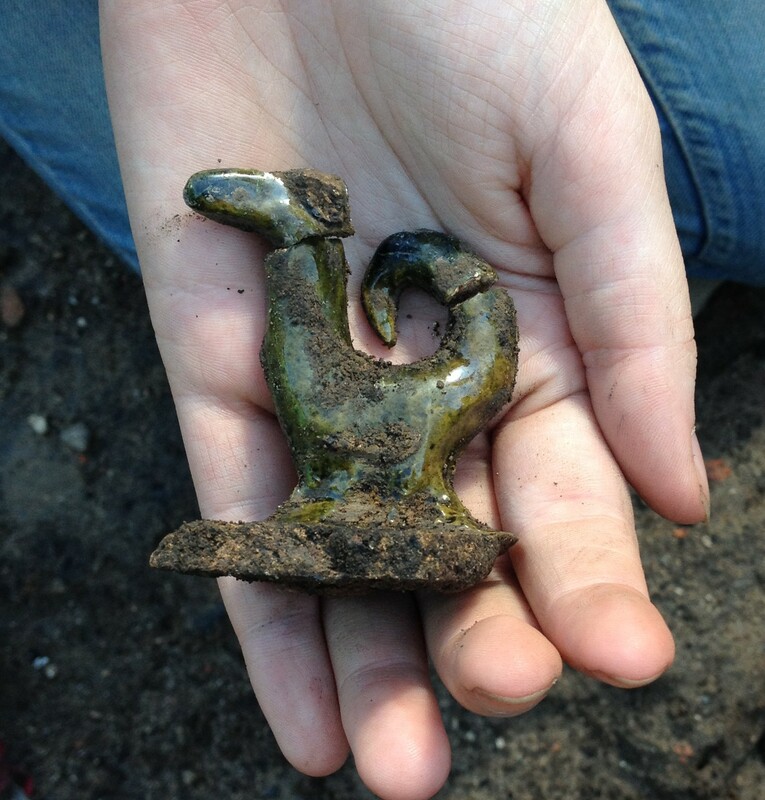 Here are some of the finer examples from this year’s dig. Pots and tiles were often dried before firing, but they would remain very pliable. Finger and thumb prints can be used to apply decoration, but they can also be accidental. 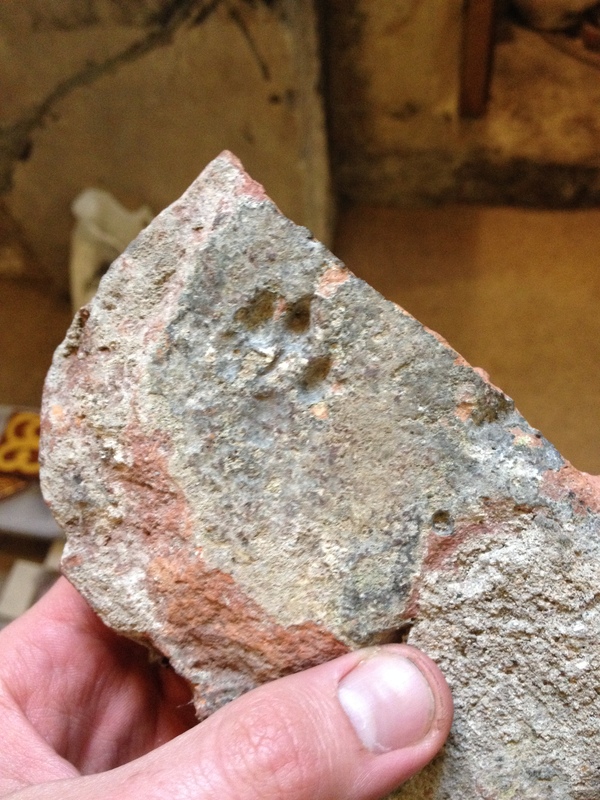 The medieval roof tile below features the fingerprints of either a very slight individual, or a small child. Child fingerprints in a medieval tile. Fingerprints in a decorative late medieval pot rim. As roof tiles were dried in the sun before firing, it is not uncommon to find that pesky dogs or cats wandered over the still-wet clay, accidentally immortalising their paw prints. These wonderful finds give medieval York’s animal population the chance to make their mark on the archaeological record. Fido’s signature on a medieval roof tile. While life could be challenging in medieval York, we have found evidence that people were taking the time to have a little fun. Local lad and regular Archaeology Live! 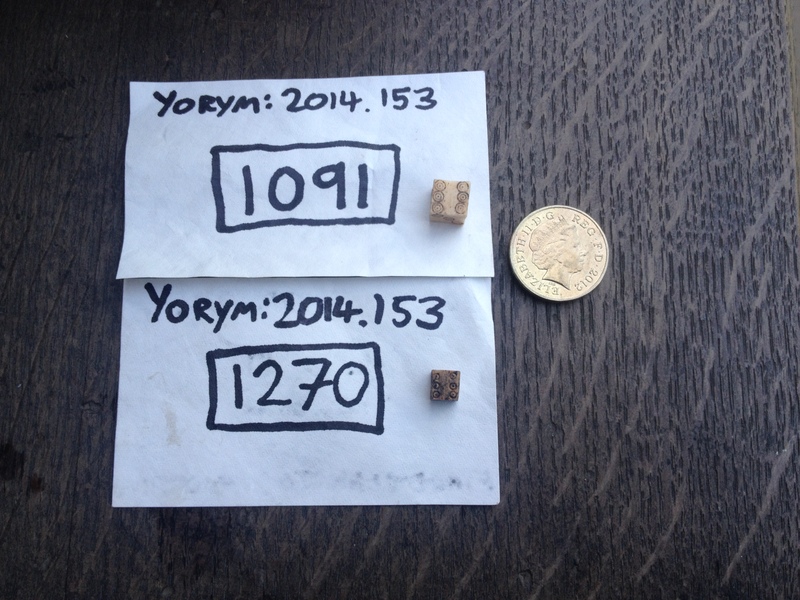 trainee Rob had a bumper year for finds; one of his finest was a tiny bone dice. Rob having a good finds day. Dice with the traditional arrangement of opposite sides totalling seven have been around from Roman times, made in bone, metal and antler. Rob’s example has a more irregular layout that appeared in the 13th century, most likely dating it to the second half of the medieval period. It is a beautiful object which has clearly been worn from use. The games it played, whether it proved lucky in gambling, and how long it remained in use will never be known, but it is a fun thing to ponder. The particular joy of this artefact is its simplicity. There is no palimpsest of meaning here, just an instantly recognisable object that could be used just as easily today as it was centuries ago. Happily, this wasn’t the only evidence of gaming to be found this year. Early in the season, Geoff was delighted to find a worked bone counter. Initially thought to be a button, closer inspection showed it to have no perforations. Instead, a small hollow had been made on one side of the disc that perfectly fits an index finger. The reverse was worn smooth, making it likely to have been a gaming piece. Its date is uncertain at present, specialist analysis may tell us more. Geoff and his bone gaming piece. 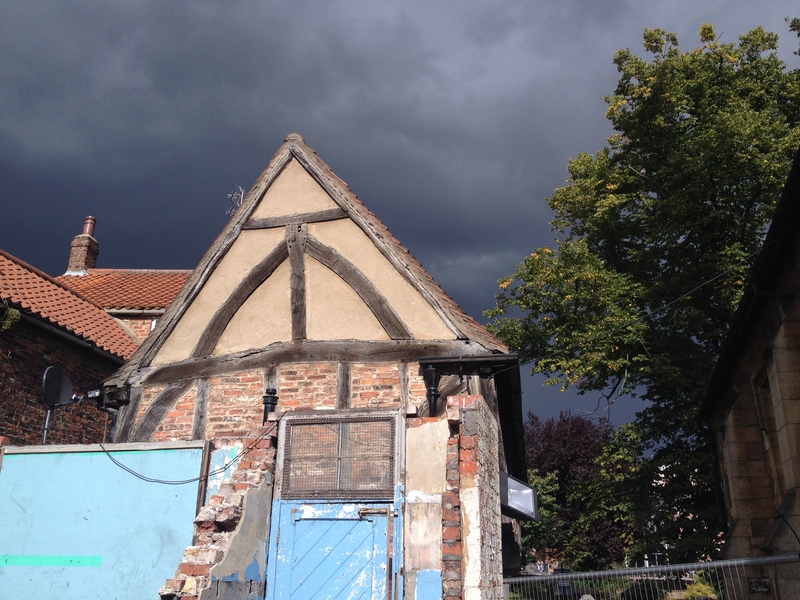 It’s one thing to recreate the sights of medieval York, but one find from 2014 gives us a clue to how the area may have sounded. This medieval object is made of bone and would have been used to tune stringed musical instruments. Tuning pegs are common finds in medieval York and reveal that music would have been part of life for people of all classes. Quite what instrument this peg would have tuned is uncertain, although one possibility is the rebec, predecessor of the modern violin, which was a popular instrument in the 13th and 14th centuries. Status was of high importance to the people of medieval York. Those with a little wealth to their name would want to be seen to be fashionable and rich. Several objects discovered this year tell us about the ways medieval people chose to decorate their clothes and possessions. 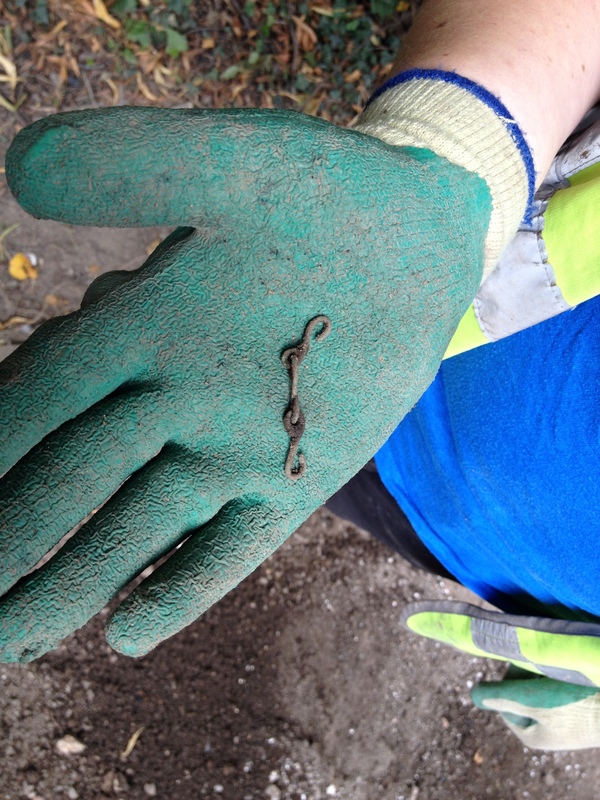 A tiny copper alloy buckle or clasp. The 2014 team uncovered a number of small strap ends, clasps and buckles. These decorative objects could have added a little flair to items items of clothing, saddlery and furniture. By their decorative nature, they reveal a certain degree of wealth. They were clearly owned by individuals who could afford more than simple, functional items. These objects will be cleaned and analysed in late 2015/early 2016 by the YAT conservation team. Who knows what more we will be able to learn about these intriguing objects. While it is tempting to clean these finds on site, they are often highly corroded and very fragile. The buckle pictured below may even have surviving fabric, preserved within the corrosion. Treated properly, this may give us direct evidence of the kind of attire people would have favoured in the medieval period. Watch this space for further news on the metal finds! It is impossible to look at every medieval find from 2014 without writing a rather lengthy tome! With that in mind, we will conclude our look at the medieval assemblage with a look at the finds that tell us more about the church itself. While the church is a wonderful example of high-medieval architecture, it is a building that has been in near constant flux for much of its existence. The changing demands and fashions of each century have seen swathes of structural and decorative alterations. Pews, floors, windows and walls have been entirely removed and re-modelled. 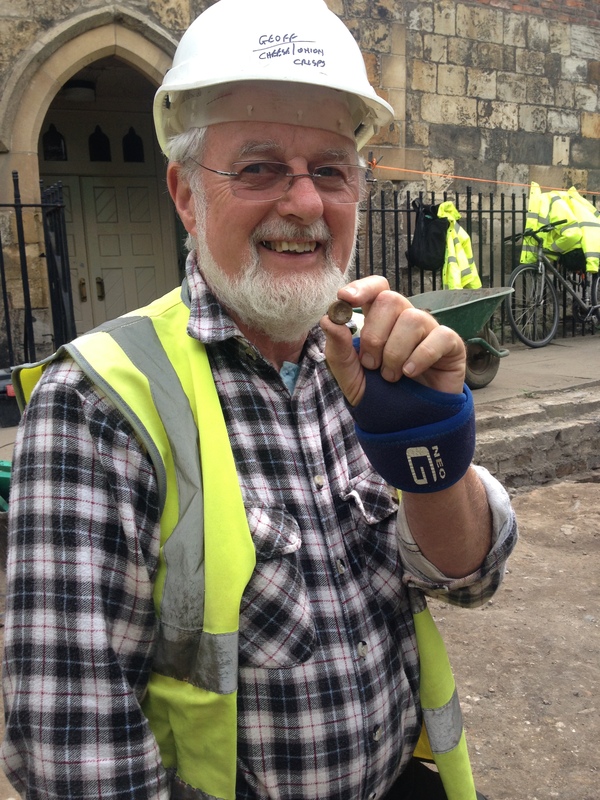 However, the finds of this year’s excavation provide us with evidence of the church’s previous incarnations. The Lady Chapel in All Saints has recently been re-floored with hand-made tiles recreated using medieval techniques to create an authentic middle ages appearance. We have been lucky enough to find examples of the original medieval floor that has since been so lovingly and faithfully restored. 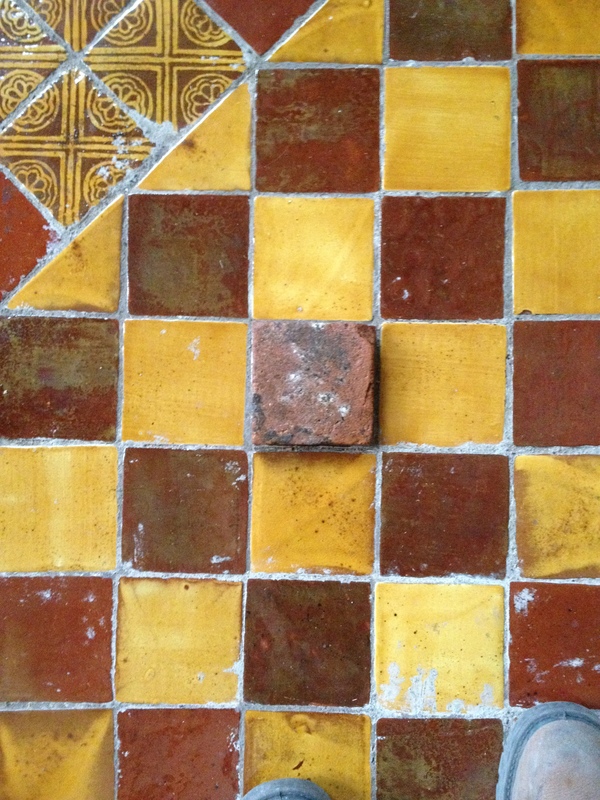 A wonderful moment this year, was laying a newly discovered medieval tile over the replica floor. It fit the traditional dimensions perfectly! A medieval tile reunited with the church floor. Working on a 19th century burial, Archaeology Live! 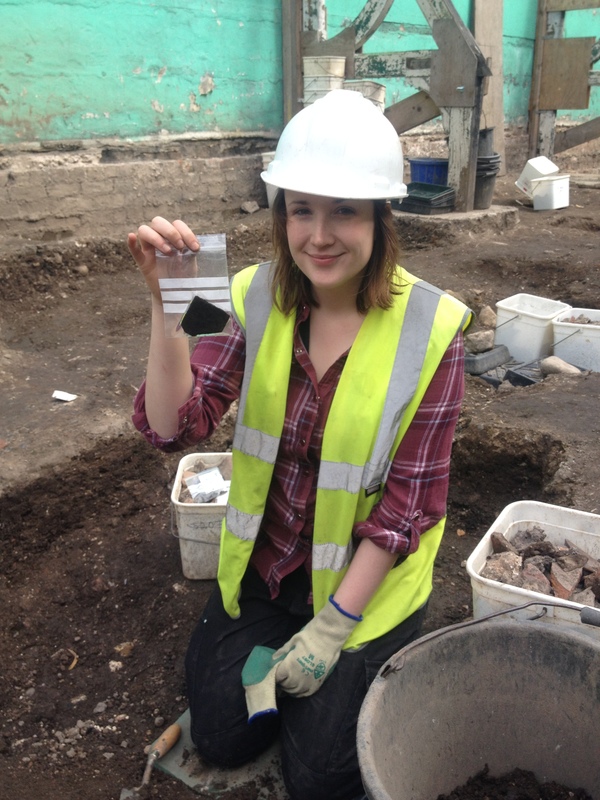 regular Belle made a wonderful medieval discovery – a fragment of stained glass. While this wasn’t the first fragment of medieval window glass to be found this year, it is the most complete and features two complete edges that give us an idea of its original shape. 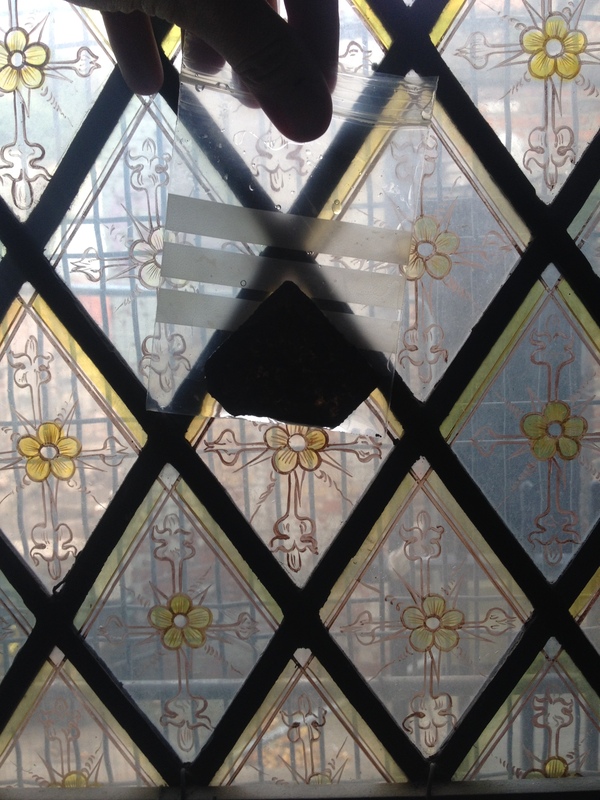 The cut edges even bear the marks of the grozing iron – the tool used by medieval craftsmen to shape the glass. All Saints is famous for its wonderful stained glass, but not all of the medieval windows have been lucky enough to survive the intervening centuries. Belle’s shard fits tantalisingly well in a current window of the church and once it is cleaned by the conservation department, we will find out whether any of the paint still survives. Placing the glass over a window that survives gives an idea of its possible appearance when new. A final find type to look at reveals even more about the church’s former appearance. 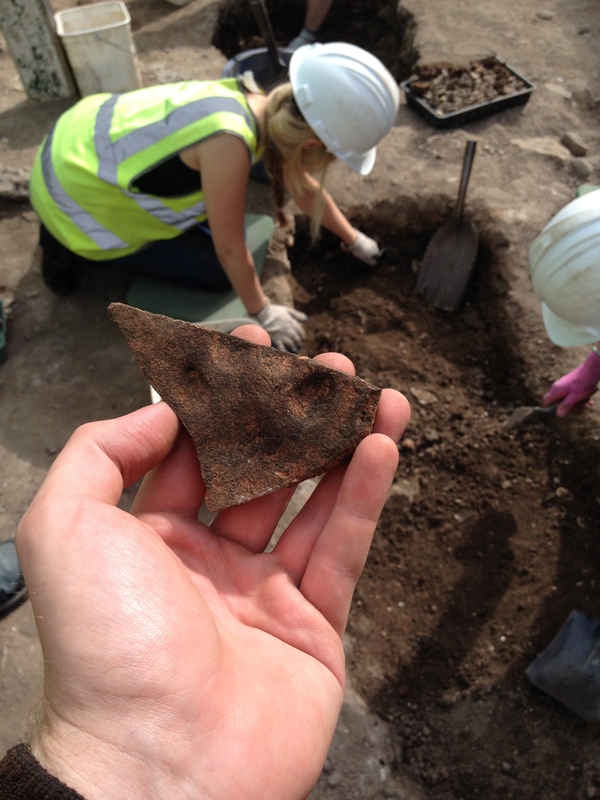 This year, our team have found numerous fragments of beautifully made glazed roof tile. Made between the 13th and 16th centuries, these tiles were expensive and would only have graced the roofs of prosperous secular and religious buildings. Their lead and copper glaze gives the tiles a bright green hue that would have looked spectacular in the sun. Anne showing off her glazed roof tile. Some examples have a darker, more purple tinged hue. Tah dah! Jen presenting her latest find. The combined evidence of the glazed floor and roof tiles present an image of a vibrant, colourful building. Much of this colour would fall victim to the tumult of the 16th century reformation, but the finds made by our 2014 team make it possible to see a little more of the church’s high medieval splendour. This brief tour of just some of 2014’s finds highlights serves as a reminder of the power of archaeology to enrich and humanise the past. Adding these pieces to the medieval puzzle removes some of the distance between ourselves and the people who lived through the times we are studying. We are so close and yet so far from truly understanding the world they would have lived in. The medieval finds from the 2014 season allow us to place our fingerprints in theirs, to decode the meanings of the ways they decorated their possessions and to roll the dice and hold the gaming pieces they would have played with. 2015 will see us reach the layers that were deposited during this age of medieval mystery. Who knows what secrets the parishioners of All Saints will have left in wait for us. Thanks for reading! 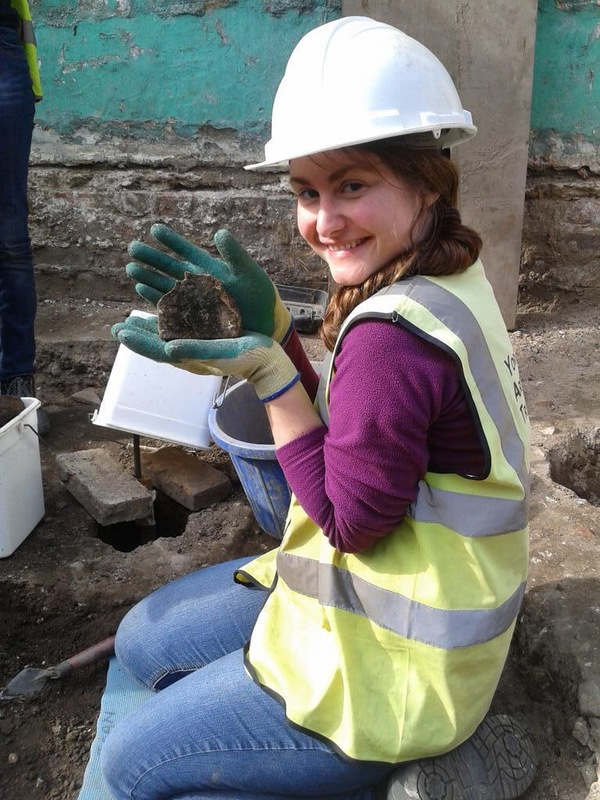 If you would like to join us in 2015 and add your own discoveries to our growing collection, email trainingdig@yorkat.co.uk to book a place on the dig or to find out more. We can’t wait to get back on site, but until then… onwards and downwards! All good archaeologists know that our discipline is not a science. While there is a definite overlap with the scientific process, our findings are always tinged with a degree of subjectivity. We are storytellers at heart, modern day bards collaborating with specialists and supplementing our tales with detailed evidence and diligent recording. The real art of excavation is taking layers of earth and stone and extracting the stories of those who occupied that same space before us. The tales are rarely complete. The pesky 1950s pipe trench has always removed the key piece of evidence; that industrious rabbit will, without fail, enthusiastically burrow in precisely the wrong place. 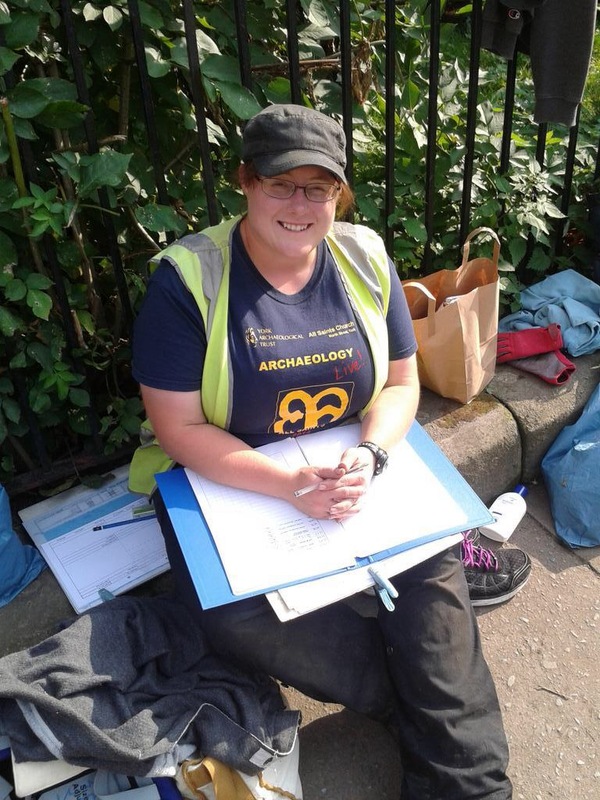 Nonetheless, we nearly always find enough to piece together at least some of the lives that were lived in our trenches and the All Saints excavation has been a fine example of this. The last 10 weeks of digging have allowed us to discern an unexpectedly complex 19th century sequence, producing along the way some incredibly human moments. Week 11 continued this theme. 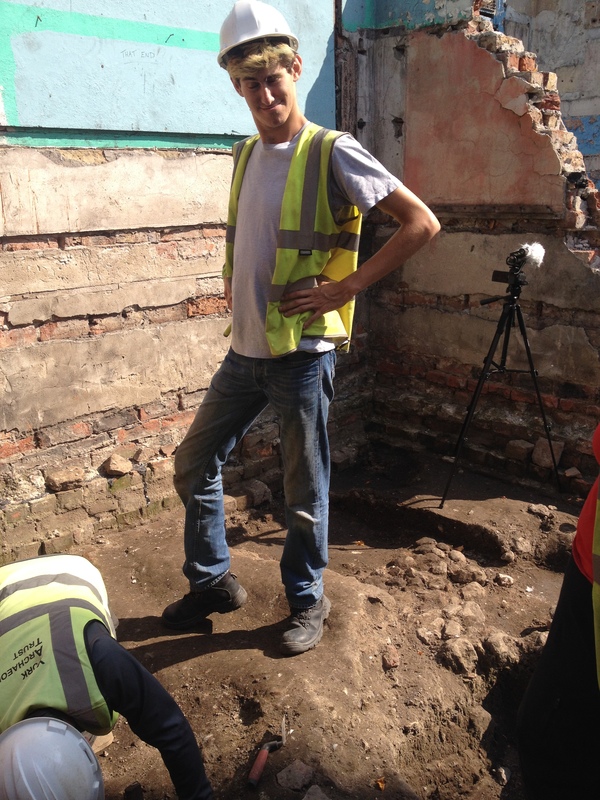 In Gary’s area, Rob and Nick cleaned up and recorded the wall footing discovered last week by Iain and Rose. One of the most exciting discoveries of the whole dig, we hope to find more evidence for what this structure was. 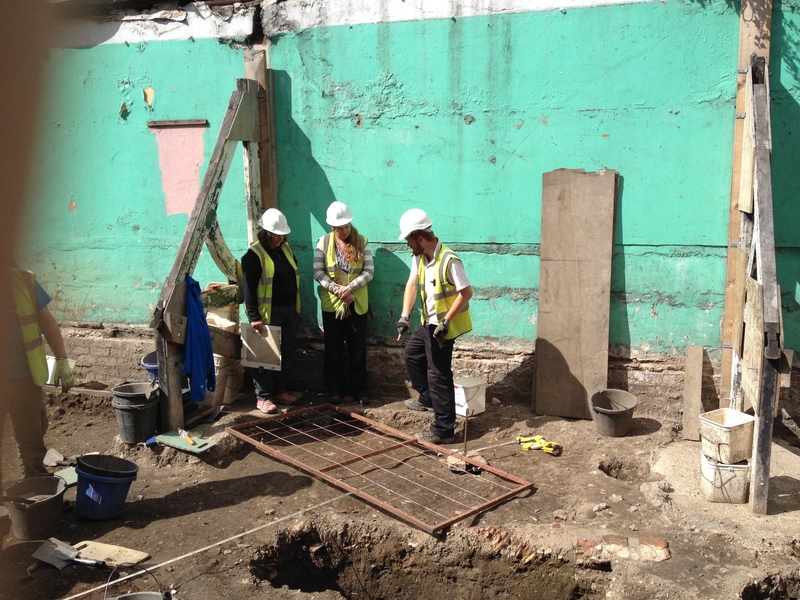 Up to press, our understanding of this area in the early 19th century has been of a busy yard becoming a graveyard. Only now are we beginning to see the first glimpses of what land uses pre-date that sequence. First things first though, we have to make sure we have located, excavated and understood all of the 19th century features before we can further investigate the earlier material. With the wall footing recorded, Rob and Nick worked to clean over the whole of ‘contrary corner’ and check for any 19th century stragglers. A rectangular deposit of dark, clayey material had been noted in the base of a pit excavated during our August training weekend. Thought to be an infant burial, this was the next feature to investigate. Nick breaks out the wooden tools. 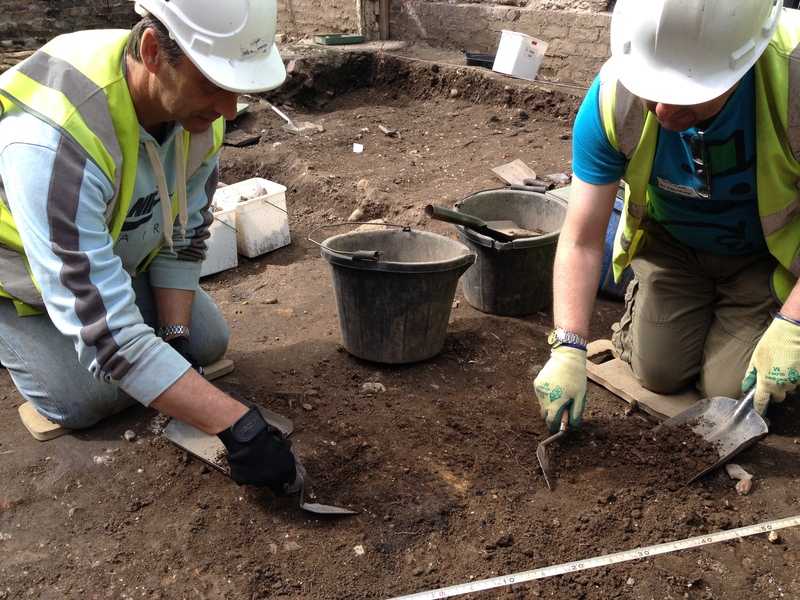 With the records complete, Rob and Nick began to gently remove the backfill of the feature, taking care not to disturb the fragile remnants of a tiny coffin. 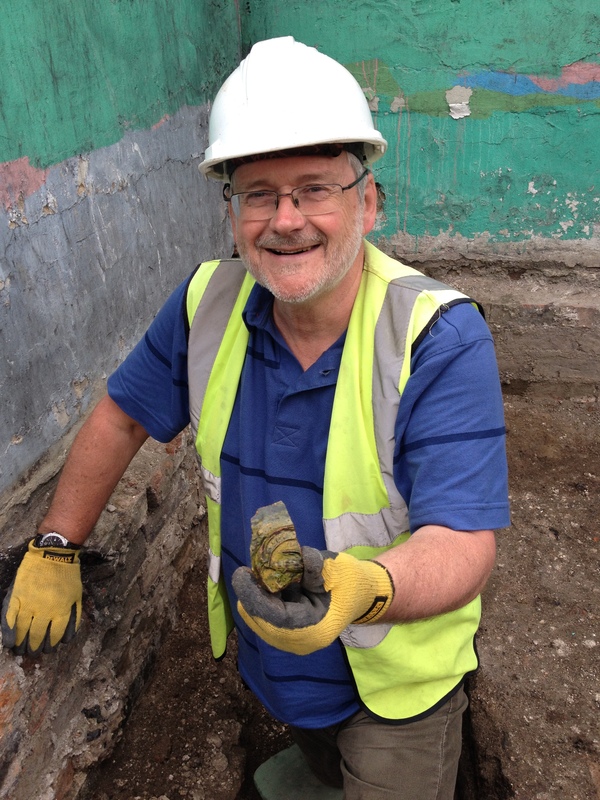 Some interesting finds quickly emerged, with Rob having a particularly good week! 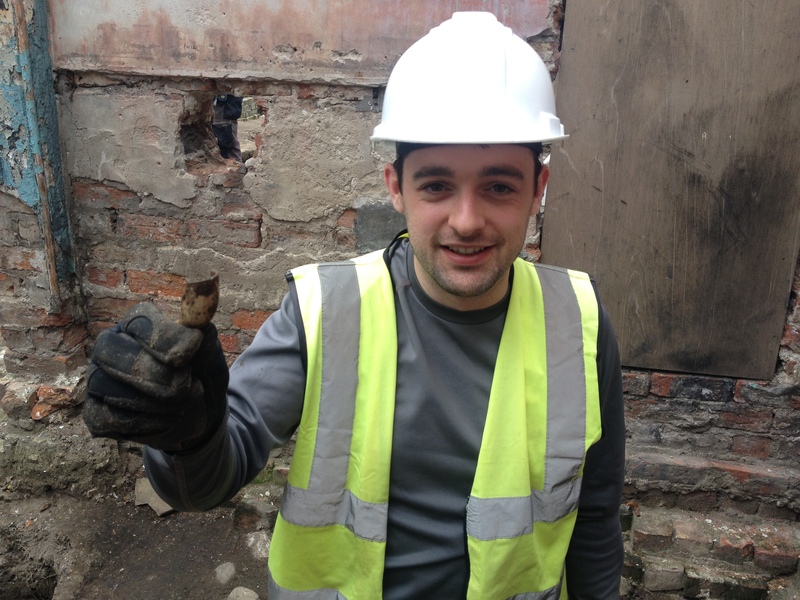 An early 19th century clay pipe bowl was discovered, fitting our suspected date of the feature perfectly. 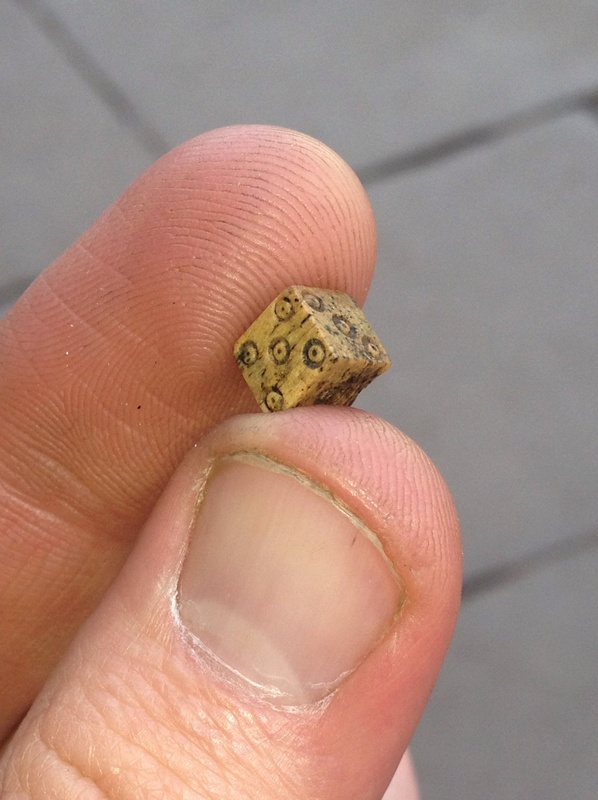 As the week pressed on, Rob was lucky enough to find a truly wonderful object – a bone dice. 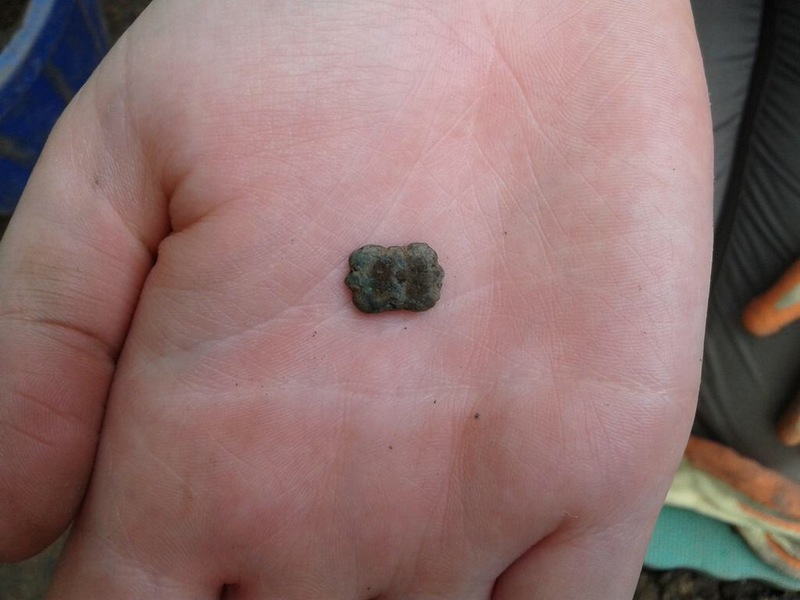 This tiny object is somewhat cruder than the medieval example found by Gina in the second week of the summer season, leading us to suspect it may be somewhat earlier in date. Similar objects have certainly come out of Viking deposits elsewhere in York, so there is a strong possibility that this object may be the best part of a thousand years old. Unlike Gina’s example, the sides of this dice do not add up to seven, the numbers seemingly being cut at random. Gina’s dice (above) is larger and better preserved than Rob’s (lower) example. They are a wonderful pair of finds! It is a genuinely wonderful object that could have been owned by someone who knew the area before the current church was even standing. One can’t help but wonder what games this dice may have played and whether or not it brought success to a gambling owner. With objects like this being discovered, the signs are good that medieval and Viking occupation deposits survive below us. 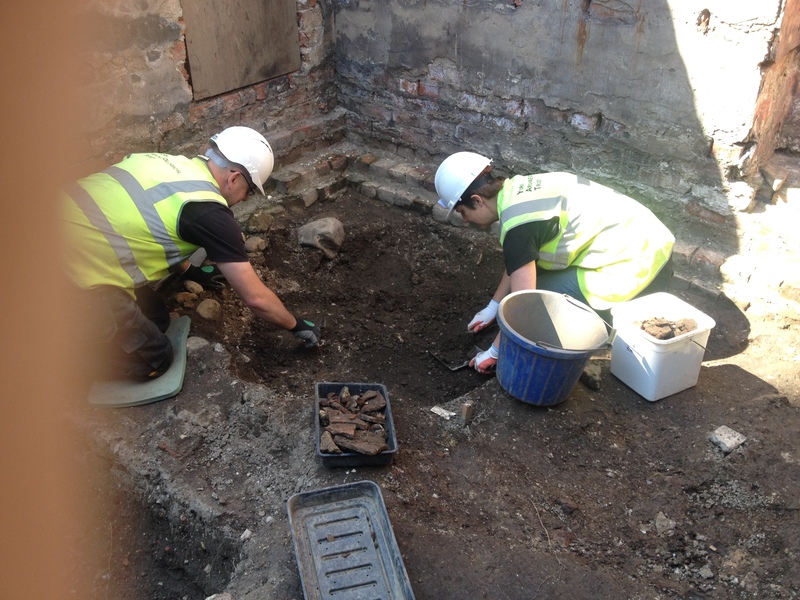 As Rob and Nick excavated the backfill they noticed an abrupt change, with the dark clayey material giving way to a stoney, mortar rich deposit; they had reached the base of their cut and found no evidence of any human remains. This left us with something of a mystery. Rob and Nick’s cut feature. As ever, the true reason why a seemingly empty coffin was buried here will never be known for sure. We can however put forward several possible explanations, the first of which being a quirk of the soil’s chemistry in this area of the trench – acidic soils can easily dissolve juvenile human remains and leave very little trace. It is also possible that the coffin could have been something of a symbolic burial, perhaps for a child lost very early in a pregnancy. While this mystery will remain unresolved, it is clear that someone in the early 19th century was driven to bury a tiny coffin in the corner of a small graveyard. Nick and Rob’s painstaking excavation of this feature allows us to witness a solemn moment in York’s story that would have otherwise been lost to history. 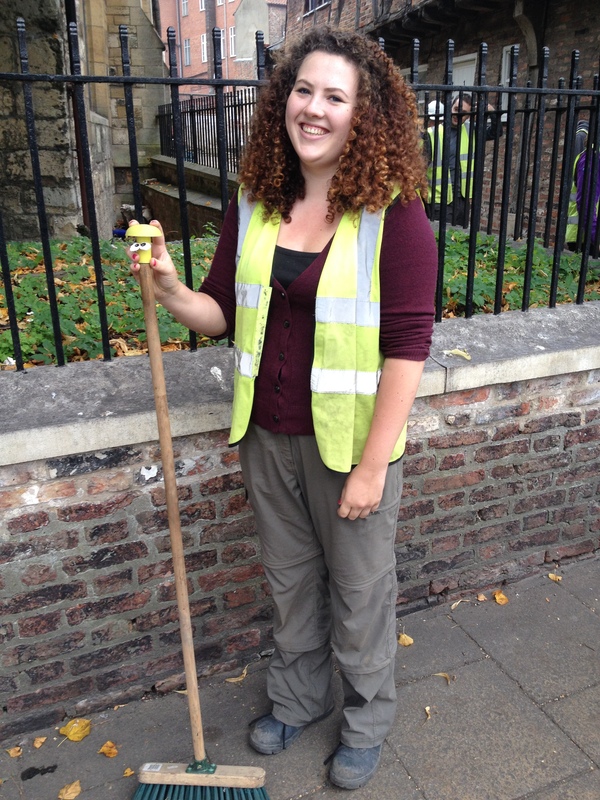 Elsewhere in Gary’s area, new trainees Sara, Anna and Liberty worked together to clean a large area of ‘that end’. Numerous edges were visible; the challenge now was to ascertain which of these features was the latest to occur. Anna and Liberty enjoying a spot of troweling. On sites as complex as this, this process can take some time! However, Sara struck gold when the edges of a sub-circular feature began to emerge. 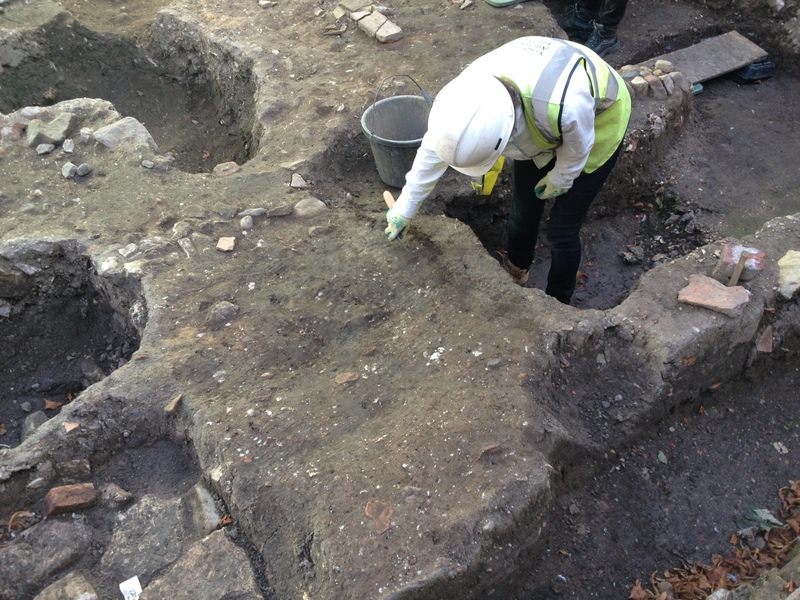 Sara reveals a pit backfill – a darker semi-circle to the left of her trowel. 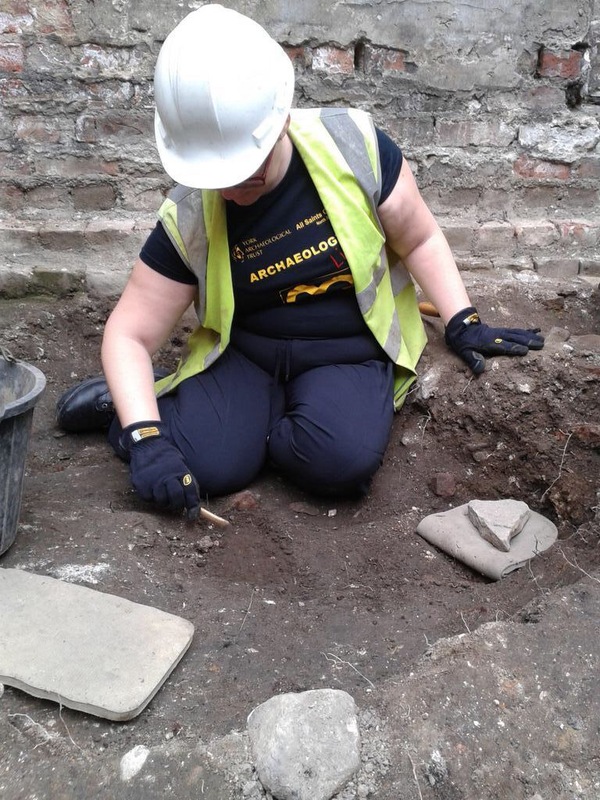 Cutting a possible fragment of cobble surface, we were keen to see whether this feature was part of the early 19th century yard or something even earlier. Sara filling out the context card for her newly discovered deposit. The deposit was photographed and recorded and the team got started with the excavation. This proved to be hard work! The deposit had clearly been trampled during the early 19th century, making it very difficult to trowel. Work begins on the pit backfill. Good progress was made on this feature, which pre-dates the adjacent ‘horn pit’. While it didn’t produce the same density of cattle skull fragments, a lot of horn core and bone was still present. This indicates that some tanning by-products were being deposited in this feature, alongside general domestic waste. This fits well with the idea that the yard space was used for numerous purposes between c.1800 and 1823. Working with Becky, Lori and Dom continued work on a pair of burials close to the northern wall of the old church hall. This required a lot of work in tricky, deep features and a lot of recording. The first task was to record the infant remains uncovered at the end of last week by Lori and Joan. Dom and Lori in recording mode. With the records completed for the infant burial, a cushion of sieved soil and wooden boards were placed over the remains to protect them from any damage. Lori and Dom’s attention then turned to completing the excavation of a burial started several weeks ago by Katie and Beverly. When the upper elements of the skeleton were revealed, it became clear that the foot end of the grave hadn’t been fully excavated. Lori and Dom amended the records for the deposit and began work on removing the last of the backfill. Establishing the true edge of the grave cut. Significantly deeper than the infant burial, this adult inhumation had surviving evidence of a wooden coffin and was very well preserved. The remains were recorded and covered over. While this was underway, Lori exposed a fascinating feature cut by both graves. On the slither of archaeology that survived between the two grave cuts, a fragment of an edge-set tile hearth with brick edging was exposed. While the date of this feature will be confirmed later, we do know that the materials used to build it are medieval in date. A tile hearth emerging between two graves. 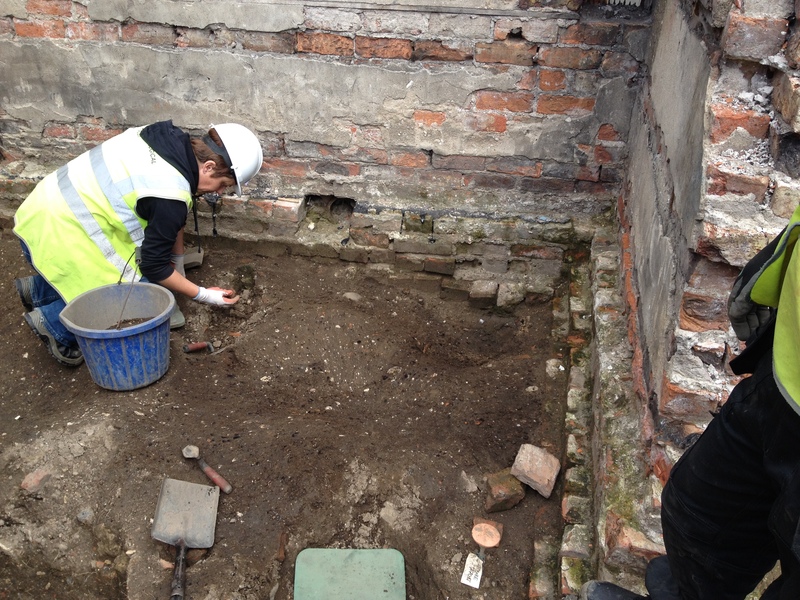 In Toby’s area, Bri and Zoe began to investigate the deposits that pre-date the two small cells within the south-west corner of the 1860s church hall. Zoe excavating an early 19th century dump. These deposits proved to be very similar to the pre-church hall trample layers exposed elsewhere in the trench. Like Lori’s tile hearth, these small islands of archaeology seem quite lucky to have survived numerous later truncation events! Bri working on a dump that pre-dates the church hall. A great mix of finds were discovered within these deposits, including medieval ceramics and a piece of post-medieval(?) chain. With attachments at either end, we’ll have to wait for specialist analysis before we know what this enigmatic find was used for. Zoe and her fragment of chain. As Zoe and Bri worked together to record and lift a number of contexts, something quite exciting became apparent. Ubiquitous until now, 19th century ceramics had ceased to occur. Not only that, the latest finds to be encountered were medieval in date. 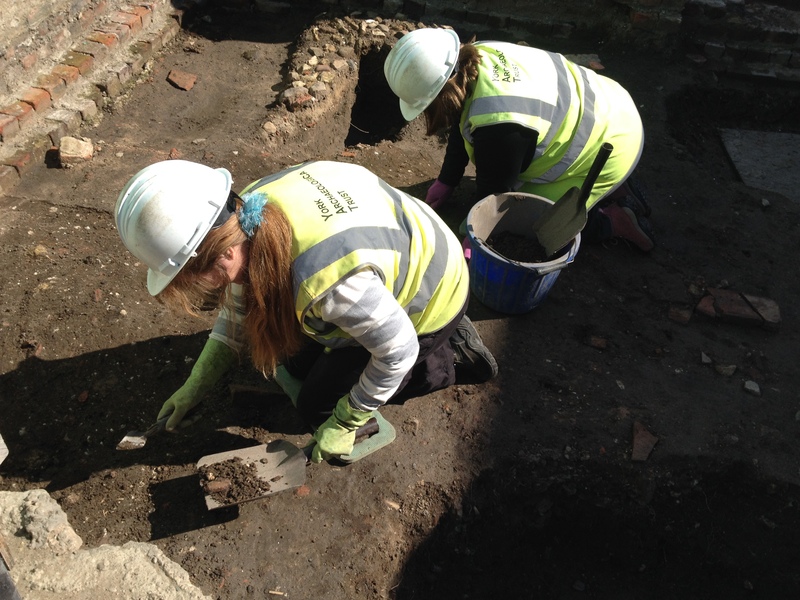 It seems that Zoe and Bri have exposed our first confirmed layers of medieval archaeology! This exciting prospect will be further investigated next week. Steve and Sarah had a week of challenging archaeology, beginning with a search for good edges around a suspected infant burial. Once these edges were clarified, the backfill was recorded and the pair got started with the excavation. 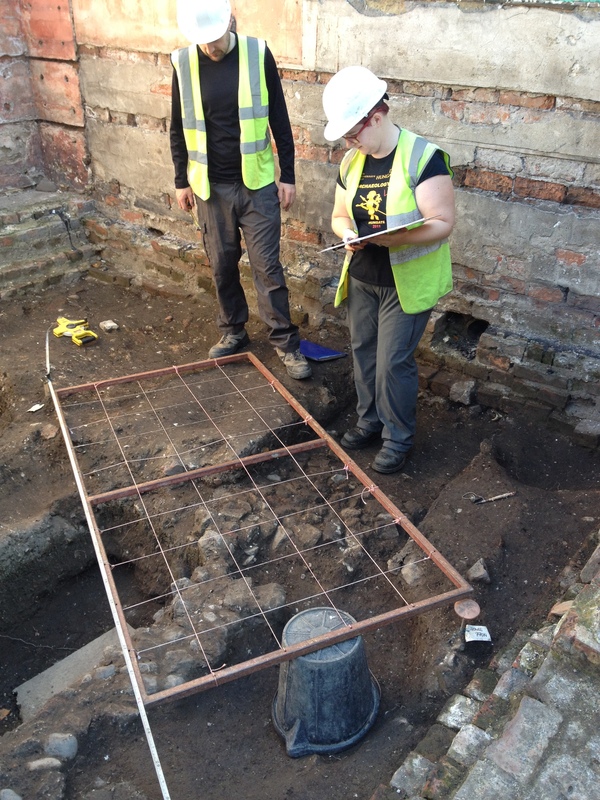 Steve and Sarah investigating a grave backfill. 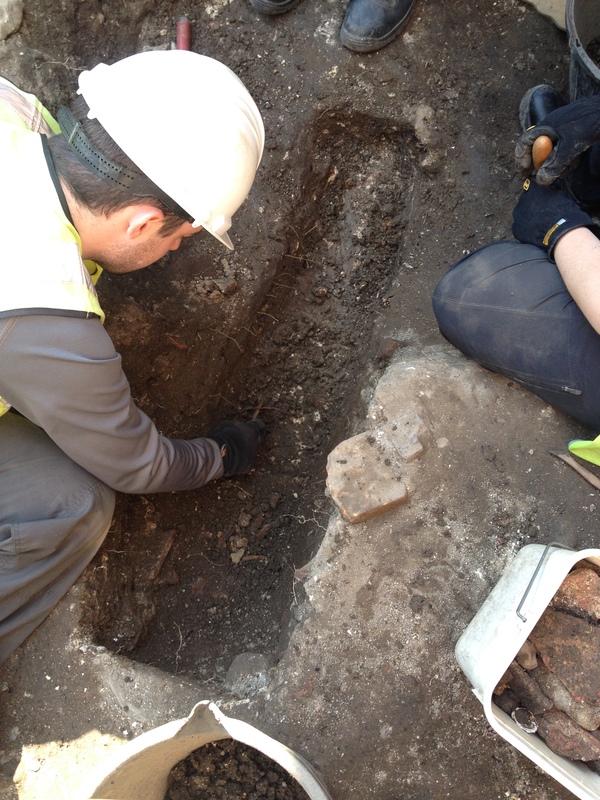 As we’ve seen across all of our grave backfills, an interesting mix of finds are generally present within them. 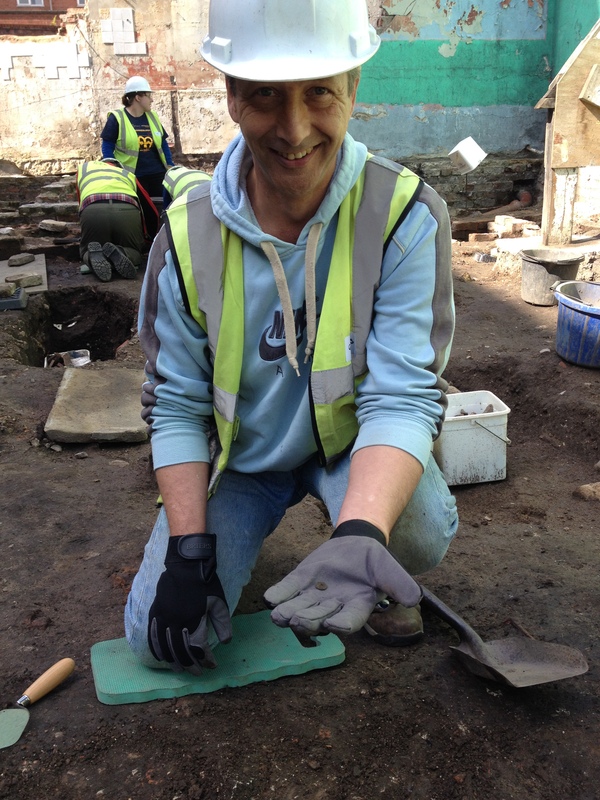 Steve found a rather lovely fragment of pressed glass. Finely made, this was clearly part of a very decorative object. 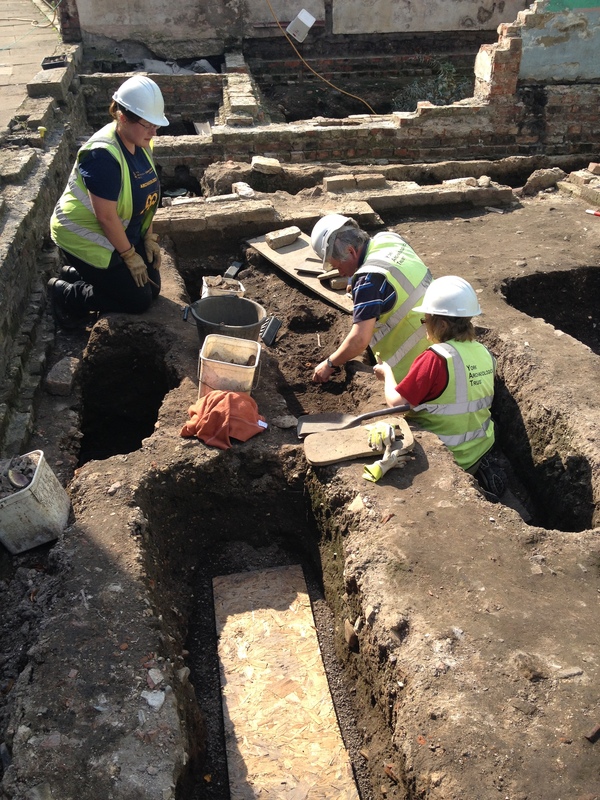 With the expert guidance of our resident bone expert Tess, Steve and Sarah patiently removed the backfill to expose the coffin and remains of a small child. These are very evocative features to work on and it is of paramount importance to keep in mind that these are the remains of a human being and should be treated accordingly. Once fully exposed, these remains will be recorded, re-c0vered and left in-situ. Steve and Sarah’s delicate work has added to an increasingly complex picture of this corner of the site. Whether the concentration of infant burials in this area relate to re-used family plots or historic pandemic events will be resolved in the fullness of time, the key aim at the moment is to locate all of the burials on site and ensure that they are protected from any future intrusive works. Maggie working on a grave backfill. 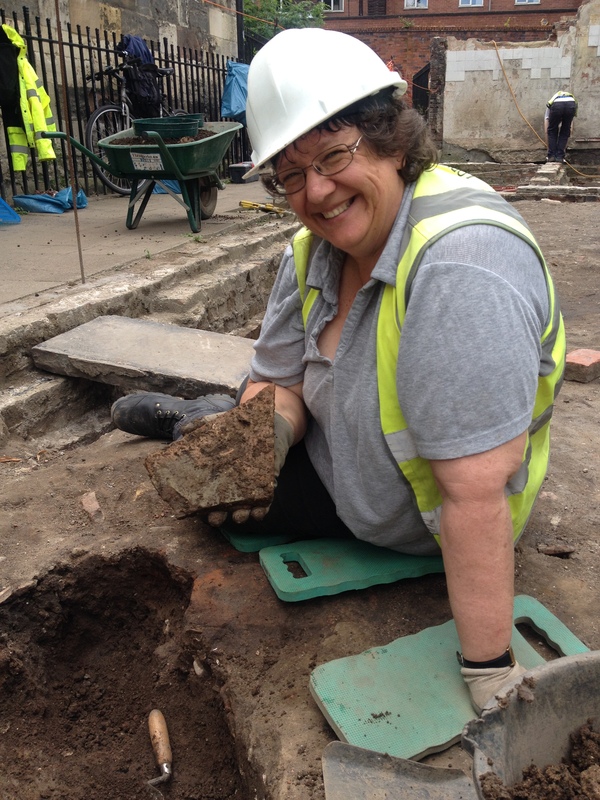 Joining us for a taster day, Maggie continued work on a grave backfill that has been worked on by a number of people this season. These things cannot be rushed and Maggie quickly mastered the art of delicate troweling, finding an intriguing flint object that may be a 19th century striker used to create sparks. 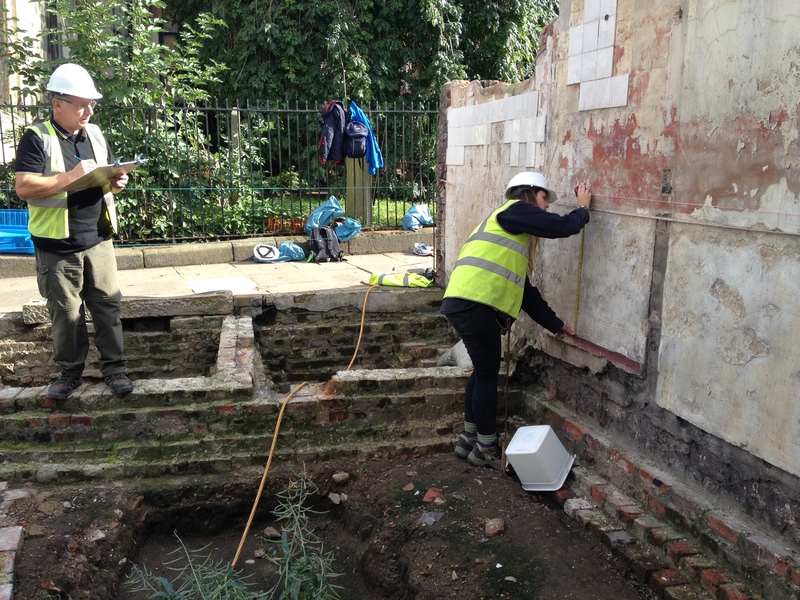 Elsewhere in ‘This End’, Jo and Liz continued work on the brick chamber attached to the north wall of the 18th century rectory. Jo and Liz troweling in the autumn sunshine. The plot continued to thicken in this area. As a post hole was recorded and excavated, it became apparent that earlier structural elements were beginning to appear. 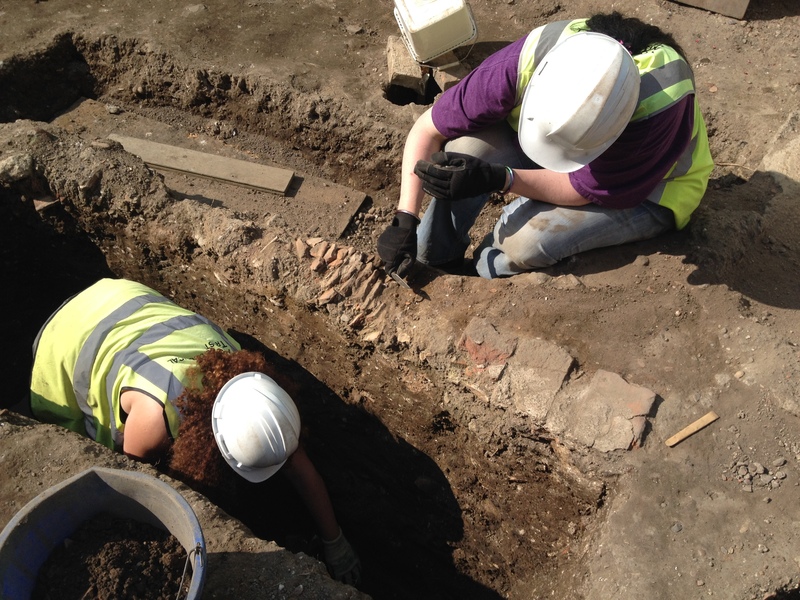 A small fragment of stone wall was revealed that clearly pre-dates the 18th century brickwork. 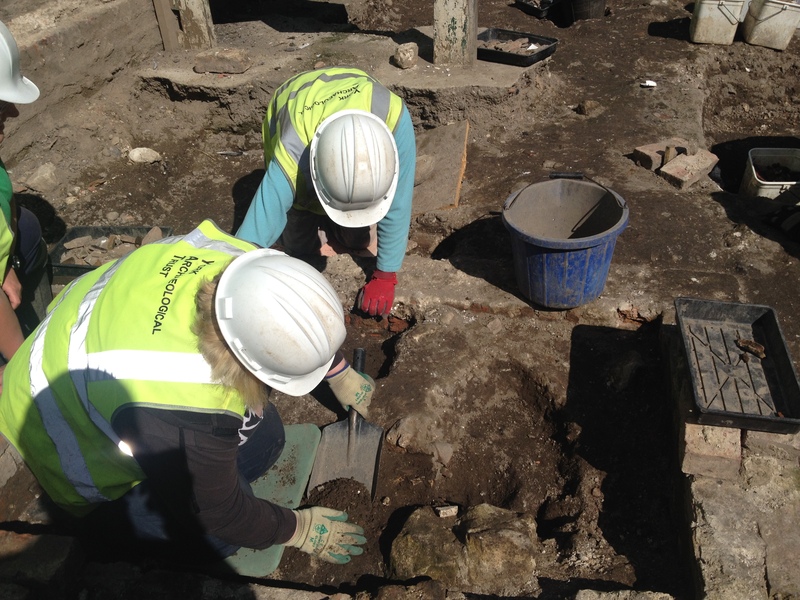 While a number of later contexts will have to be removed before we can expose this stonework, it is distinctly possible that Jo and Liz have revealed a fragment of the medieval rectory that was incorporated into the post-medieval re-build. A very exciting find! Recording a post hole that cuts possibly medieval stonework. The cobble-based cesspit (upon which Donald is standing in the image below) now seems to have been brought to construction level, sitting atop a mortary deposit. 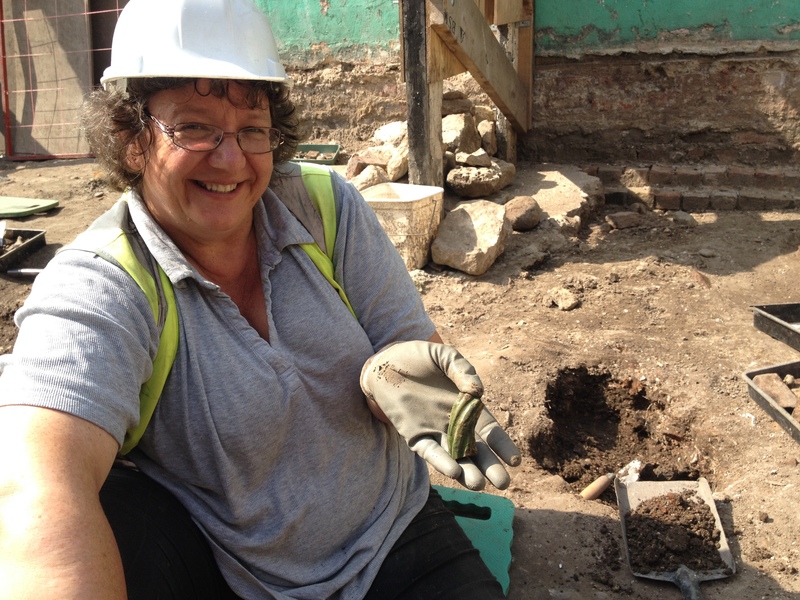 Jo and Liz recorded the wall and the deposit below it and ended their week by investigating the earlier deposit. 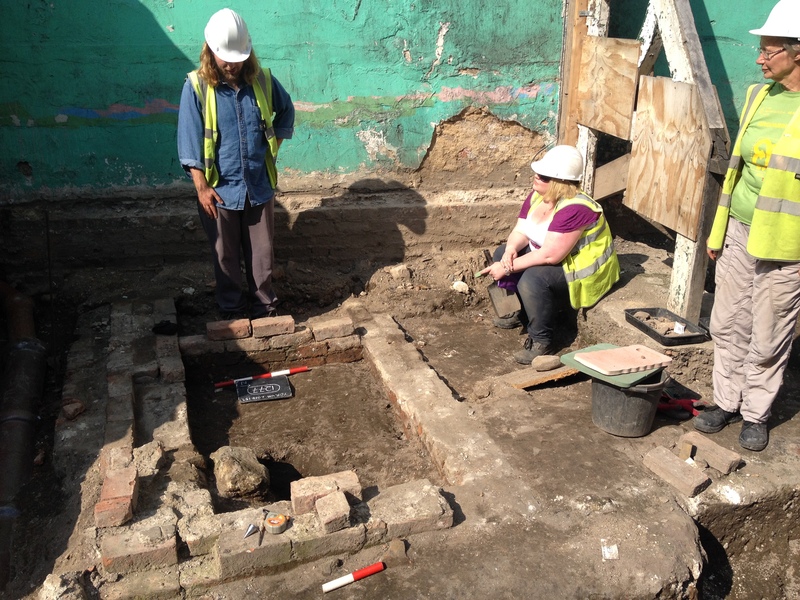 Week 11 has seen some exciting developments in this area, with the small brick chamber exhibiting a more complex sequence than had been anticipated. As the dig continues, we will continue to expose and record the various alterations to the structure and, once these are removed, we will finally be able to see exactly how much of the medieval buildings survive. Watch this space!! 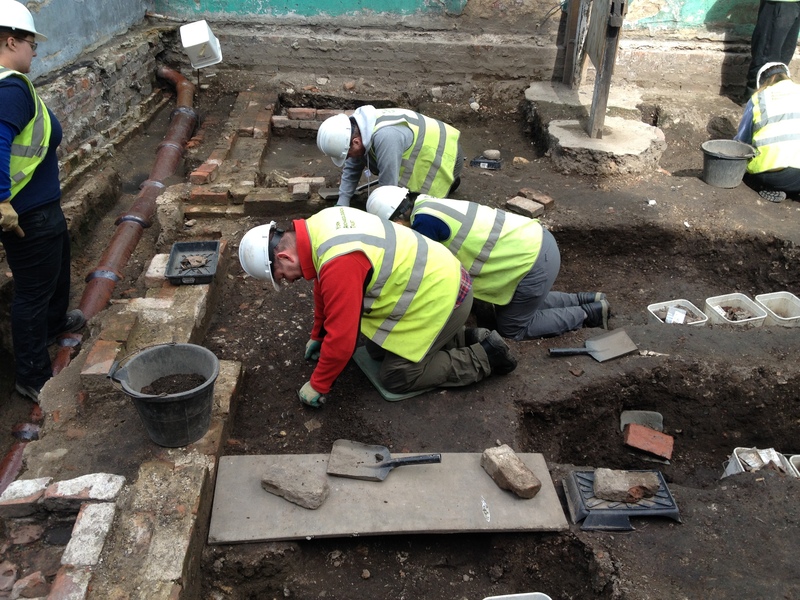 Donald, Jo and Liz recording a deposit within the brick chamber. An eventul week in the trench was mirrored beneath the Tree of Finds where a number of exciting artefacts were cleaned up and looked at in more detail. The Finds Tree looking typically resplendent. While washing what was assumed to be another muddy fragment of medieval roof tile, Rob noticed some markings on the fabric of the tile. 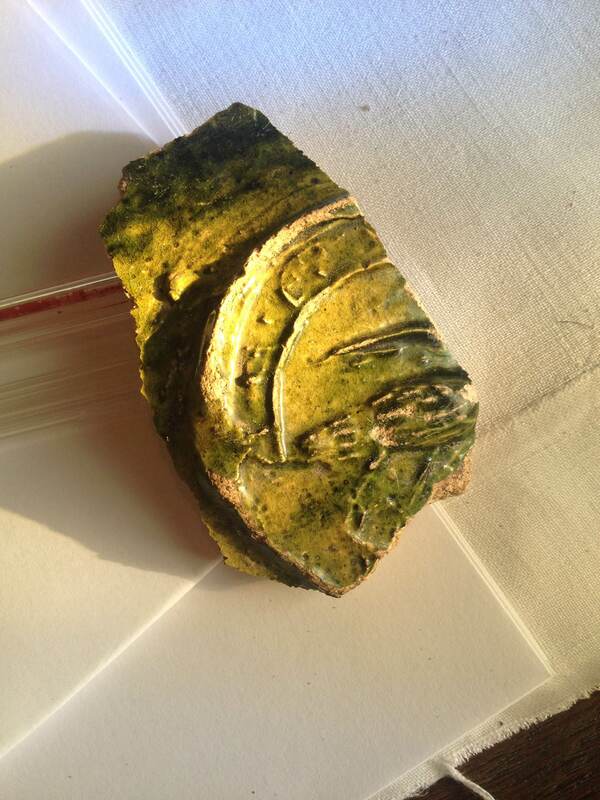 Closer inspection revealed part of a legionary stamp, clear evidence that this was actually a Roman tile! The letters ‘VIC’ were faintly visible in the side of the tile. This stamp most likely relates to the Legio VI Victrix (Sixth Victorious Legion) of the Roman army. In 119AD the legion was despatched to northern England to help repress an uprising and eventually replaced the incumbent IX Hispana to garrison the fortress of Eboracum (Roman York). Finding such direct evidence of the area’s Roman past was a real privilege, which was only made sweeter when the thumbprint of a Roman potter was noticed beside the stamp. Being able to put your thumb into an almost 1900 year old thumbprint is a unique perk of archaeology. What a find! ‘VIC’ and a clear thumbprint. 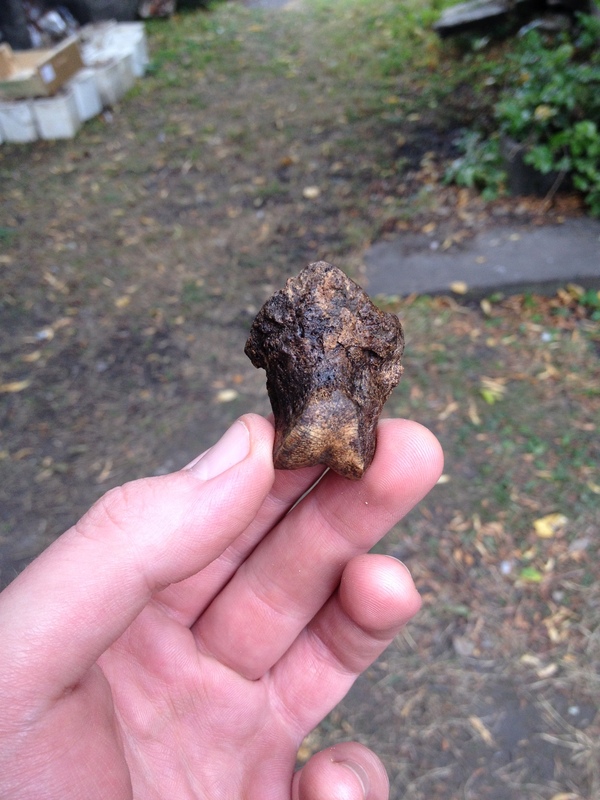 Another interesting find was a toe bone from a rather unwell cow. 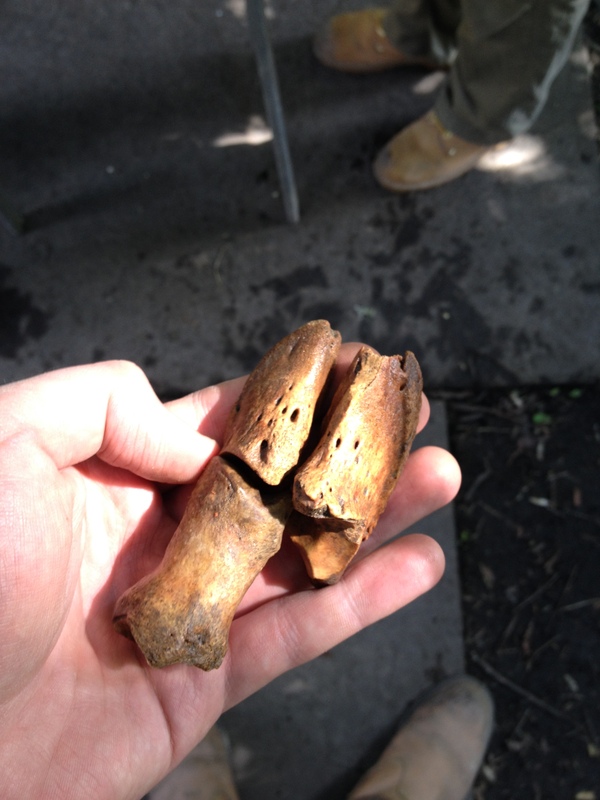 We’ve had numerous examples of diseased cattle bones from features associated with the tanning industry. This 19th century example exhibits clear evidence of bone infection and would have been of sufficient severity to render this foot completely useless. Poorly cows seem to have been common. Week 11 saw us continue to build on the findings of the previous week and to better understand a fascinating 19th century sequence. It seems that our first season at All Saints will be best remembered for demonstrating the merits of early modern archaeology, a period that has been criminally under-valued until now. We have uncovered moments of early 19th century heartbreak, with numerous juvenile and infant individuals being interred along Church Lane, but we have also found evidence of more carefree times with Rob’s fantastic bone dice. Next week, we hope to add to this picture of 19th century York and wrap up the remaining loose ends. We also hope to reveal more sneak peeks of the earlier archaeology that will be the focus of next year’s excavation. The tantalising glimpses of the Roman, Viking, and medieval deposits that lay beneath us highlight what an exciting site this is. Massive thanks go out to the week 11 team for their patient, careful excavation and fine company. 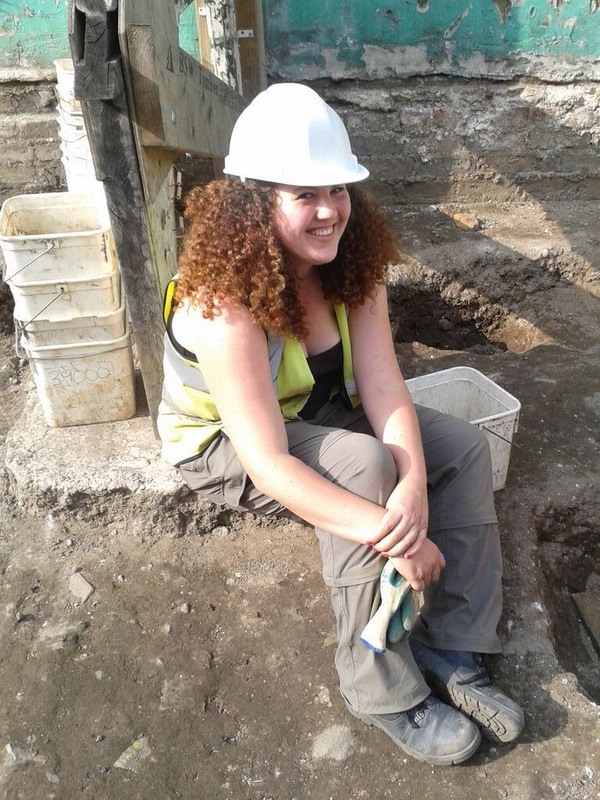 On a less jolly note, week 11 saw us say goodbye to two placements who have been absolutely invaluable to this year’s excavation, Becky and Tess. This pair of Arch. Live! veterans have very bright futures ahead of them! 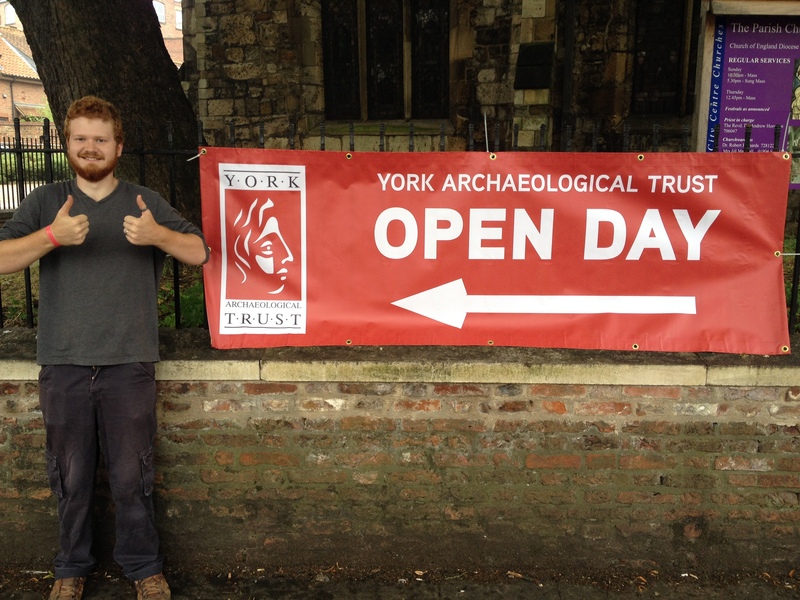 Huge thanks go out to Becky and Tess from all at York Archaeological Trust, we’ll see you next time. It’s been a vintage year for the Archaeology Live! project in our new home on North Street. Now we head into the last week of the summer with a thousand questions and a lot of excitement for more thrilling discoveries. Best get cracking then, onwards and downwards! PS. One amusing moment to share. Archaeology Live! placement Jack was late for the group photo on Friday, assuming he was ill we were forced to improvise a replacement. I think we truly captured his essence!